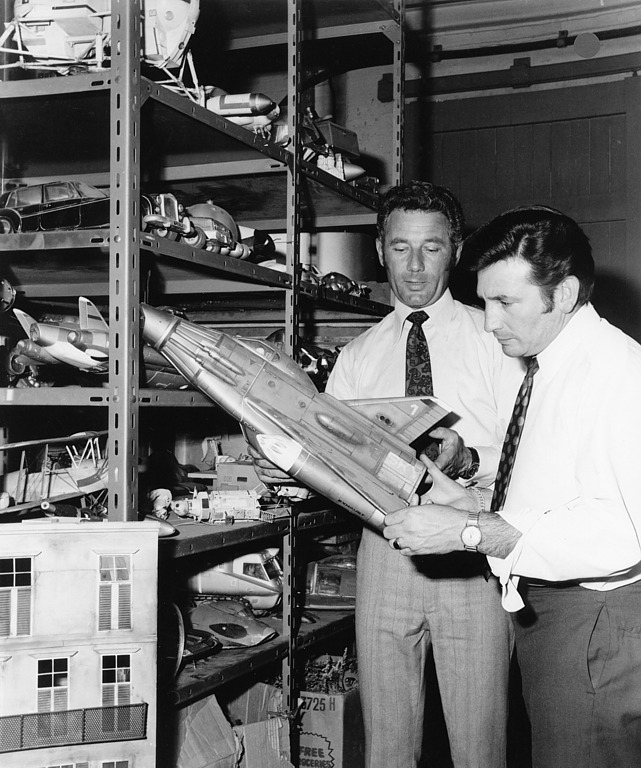 UFO is a 1970 science fiction television series created by Gerry and Sylvia Anderson and was the final production of Century 21, formally AP Films, who had previously been responsible for other hit shows such as Thunderbirds and Captain Scarlet and the Mysterons. 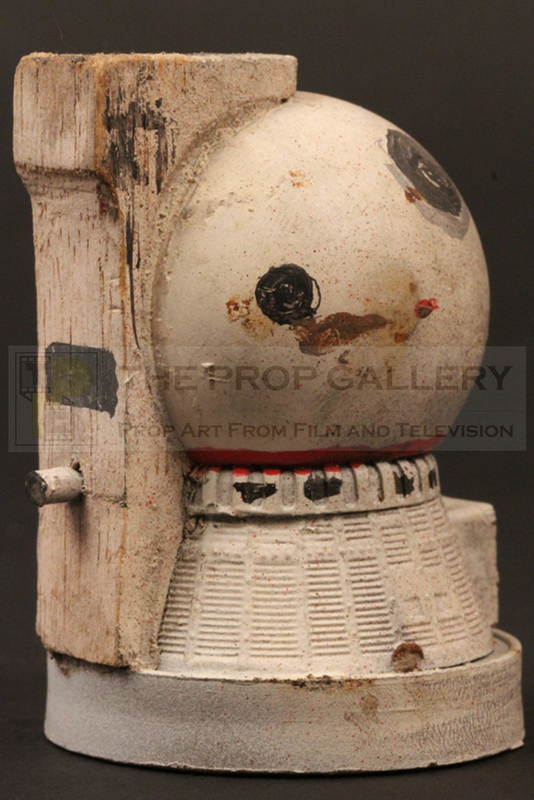 UFO was the Anderson’s first live action series, financed by the Incorporated Television Company (ITC) of media mogul Lew Grade who like what he saw in the Anderson produced film Doppelganger, the series was aimed at a more adult demographic than their earlier marionette based work. 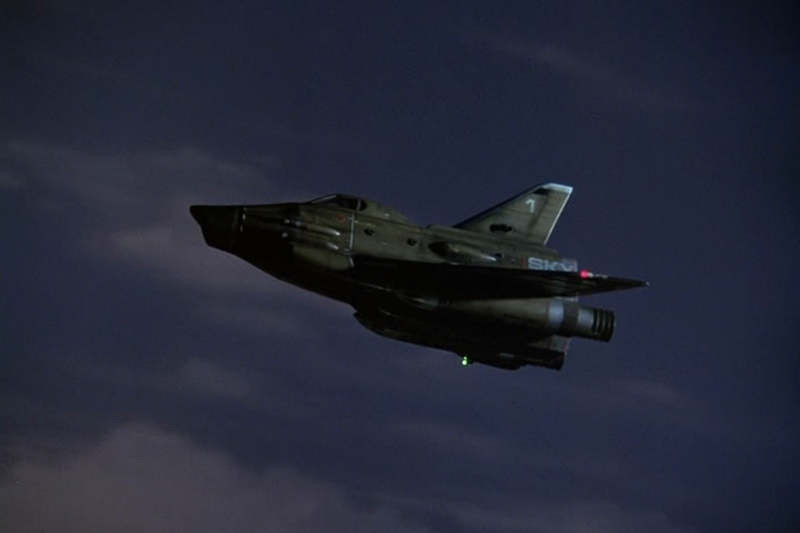 The series follows a secret military organisation known as SHADO, an acronym for Supreme Headquarters Alien Defence Organisation, who defend the Earth from alien invasion under the cover of the Harlington-Straker Studios. 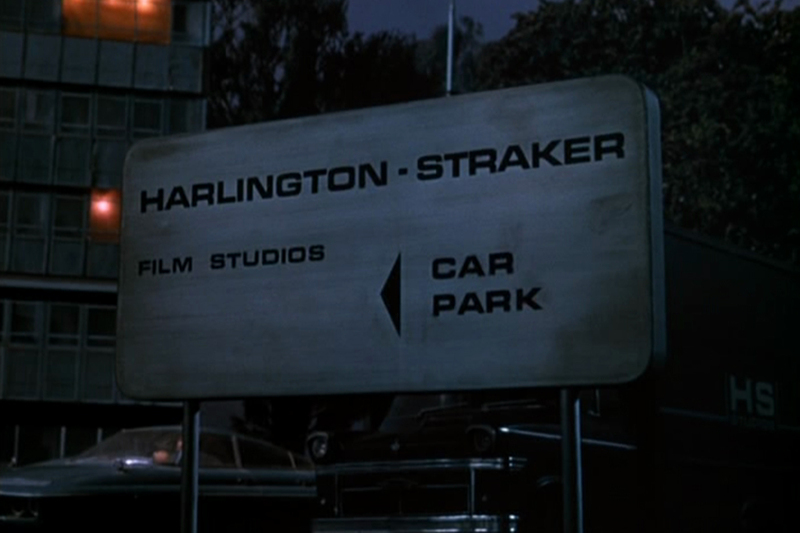 Starring Ed Bishop as Commander Straker much of the series was filmed the MGM British Studios, later known as Elstree, which doubled as the Straker Studio in a clever money saving move. 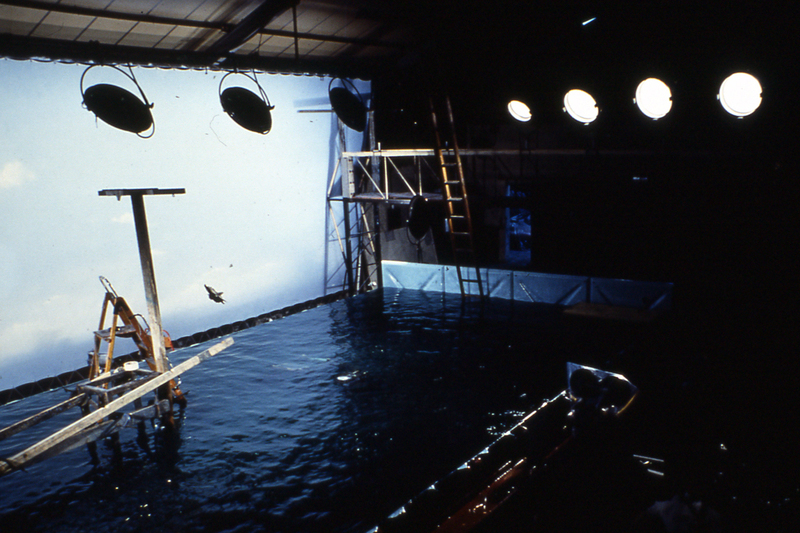 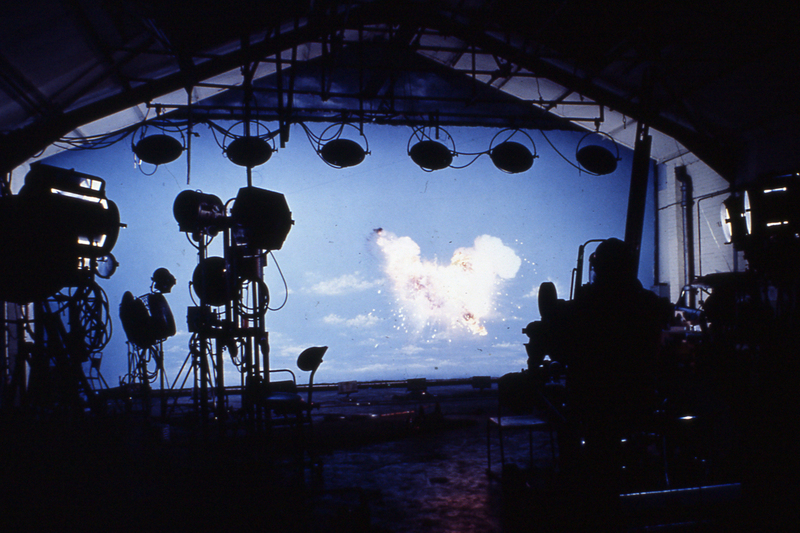 While the series may have lacked puppets it did feature Anderson’s other trademark, stunning model miniature effects sequences realised by longtime collaborator Derek Meddings who would go on to become an Academy Award winner and one of the most highly regarded and influential effects talents ever to work in the industry. 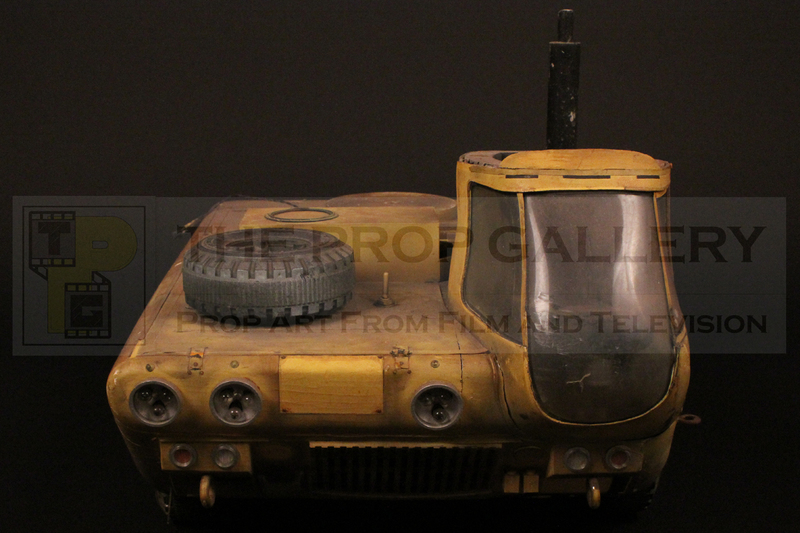 In early 1969 Century 21 set about realising the requirements for filming from their studios in Slough and work began on developing the various SHADO vehicles. 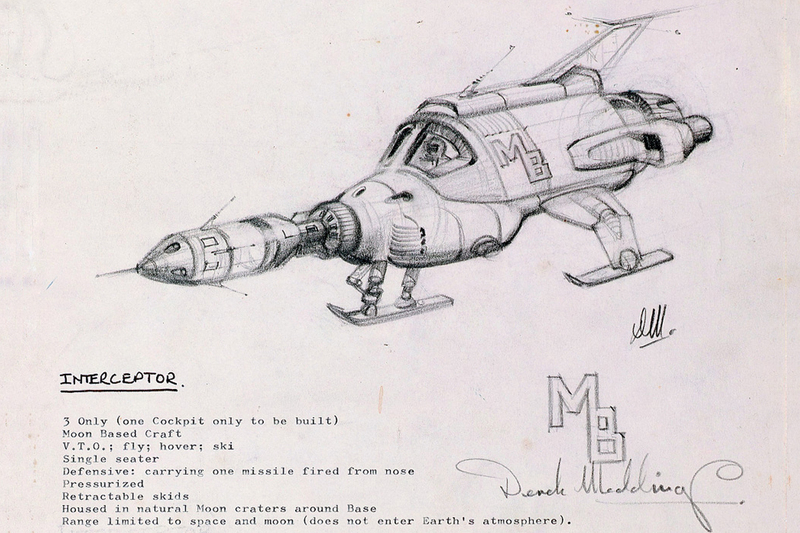 Instrumental in this process were Derek Meddings and prolific designer Mike Trim who created concepts which were to bring yet another Anderson world to life. 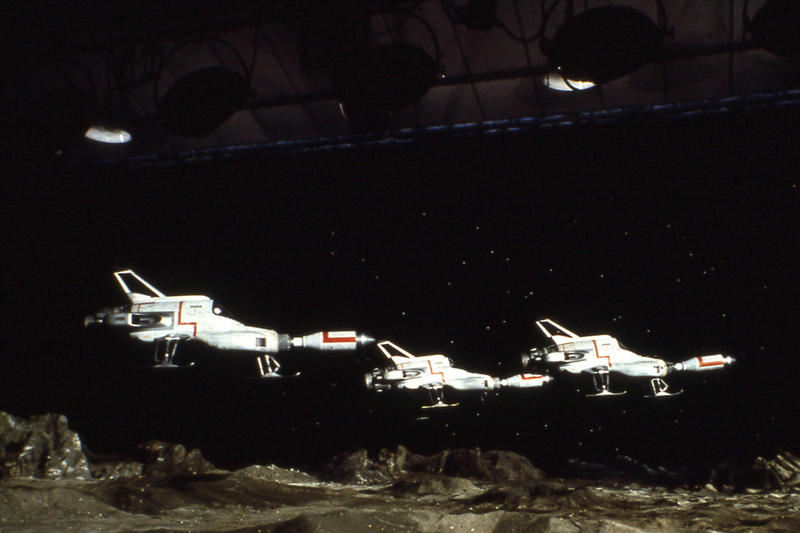 Miniatures were built in various scales by the talented Century 21 model makers, the old puppet stages used on previous shows were transformed in to fully fledged visual effects stages to handle the construction of larger model sets and filming began in April 1969 under the supervision of Meddings. 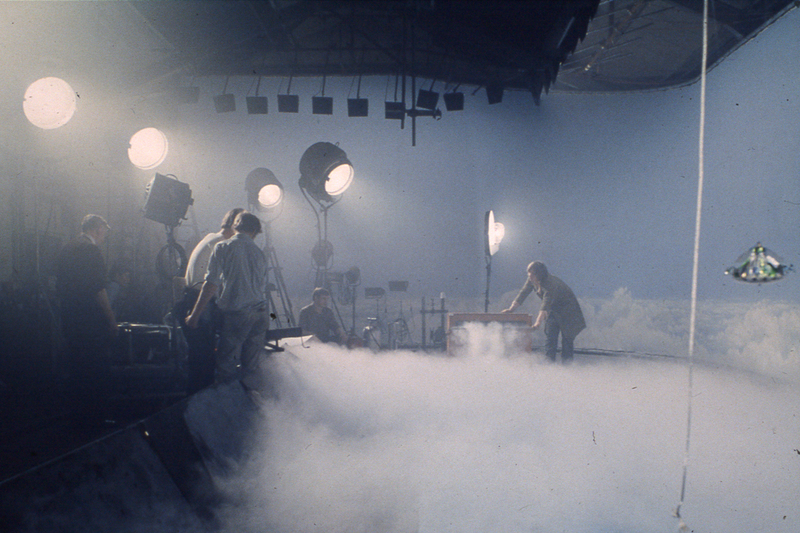 The results did not disappoint with the effects team creating some of the most visually stunning and groundbreaking model effects work that had ever graced our television screens. 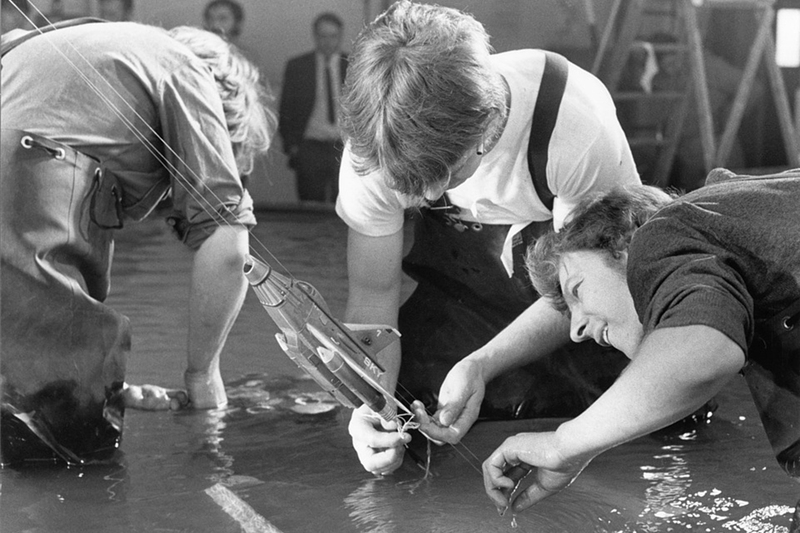 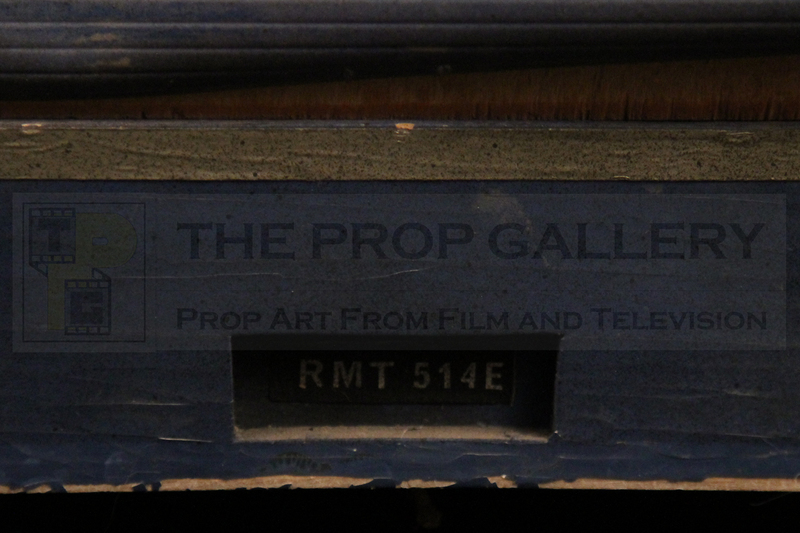 Over forty years later the original studio used models are few and far between, many were destroyed following the closure of Century 21 or cannibalised for use in other productions, notably by the BBC. 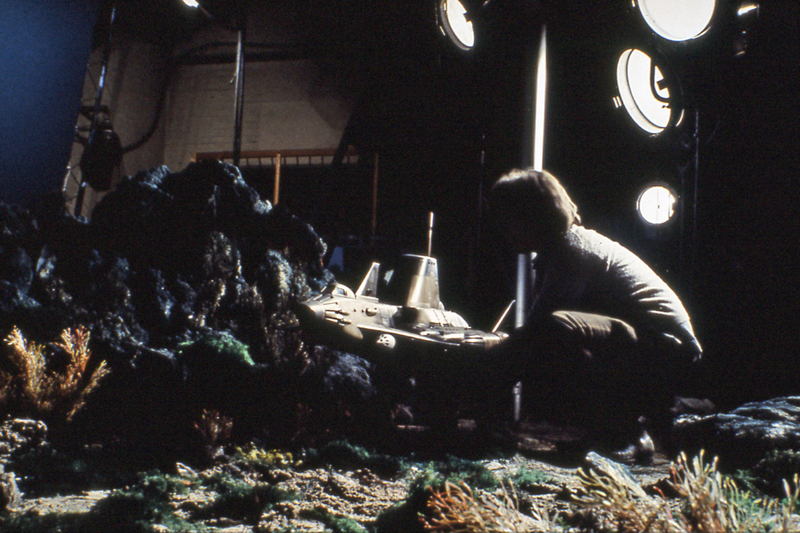 The miniatures that follow represent a significant portion of the original studio models known to still be in existence today. 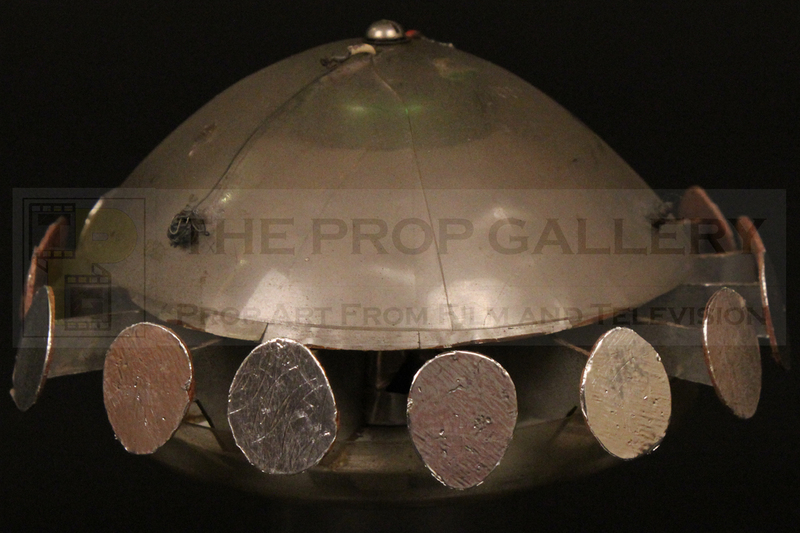 The series macguffin and title vehicle was surprisingly the subject of much discussion and not as straight forward in its design as one would think, however it was ultimately decided to stick with what had become the classic image of a flying saucer in a design finalised by Derek Meddings in March 1969. 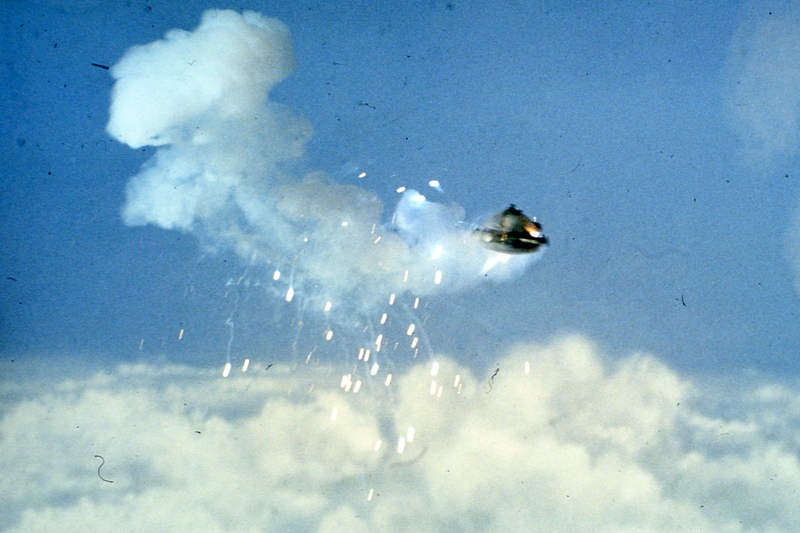 Meddings envisaged the UFO’s having an unclear and fuzzy appearance as he had seen in photographs and decided that the models should spin and reflect light as they did so, this effect was to prove much more difficult to achieve practically than in theory. 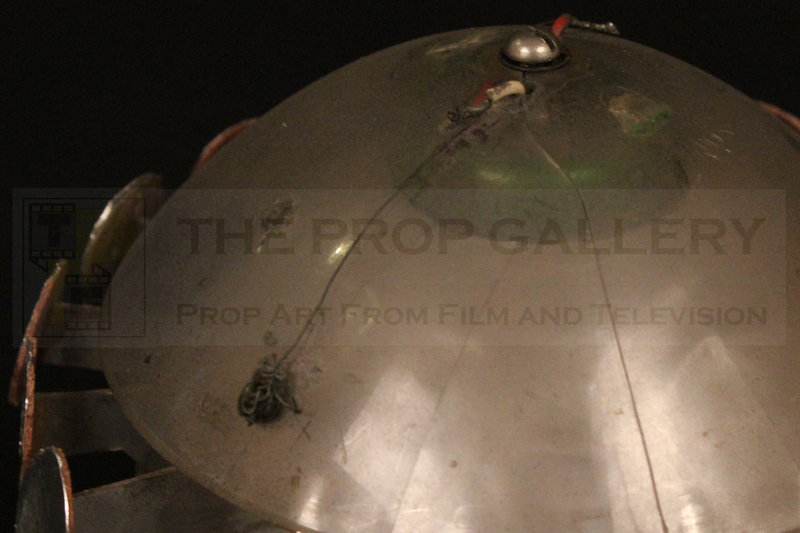 The top dome of the miniature is constructed in heat formed perspex and is attached to a central column which houses a small motor; this would spin the lower part of the model around while the top remained static, the motor was powered through two of the wires which were used to suspend the miniature during filming resulting in a hovering spinning saucer. 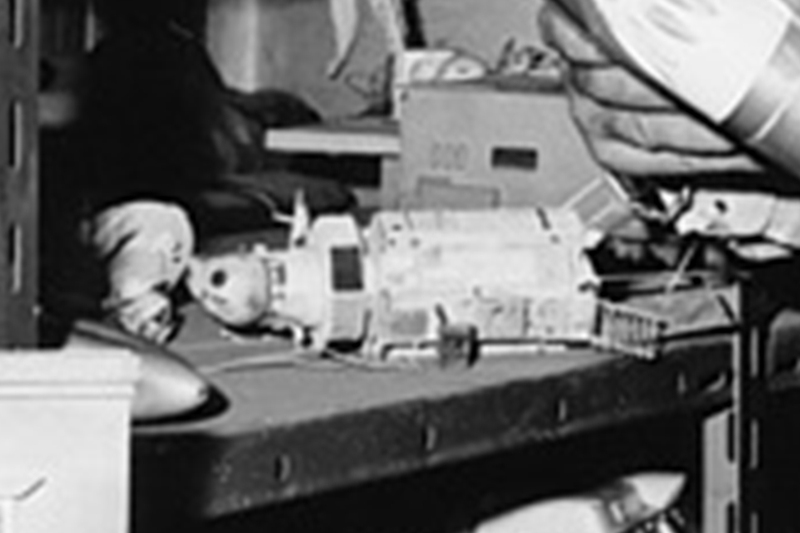 The top dome features small holes where small pyrotechnic charges would have been placed while the lower body of the miniature was dressed with a number of paddles which were covered in a highly reflective material in order to catch the light as it spun around giving the desired ethereal and otherworldly appearance. 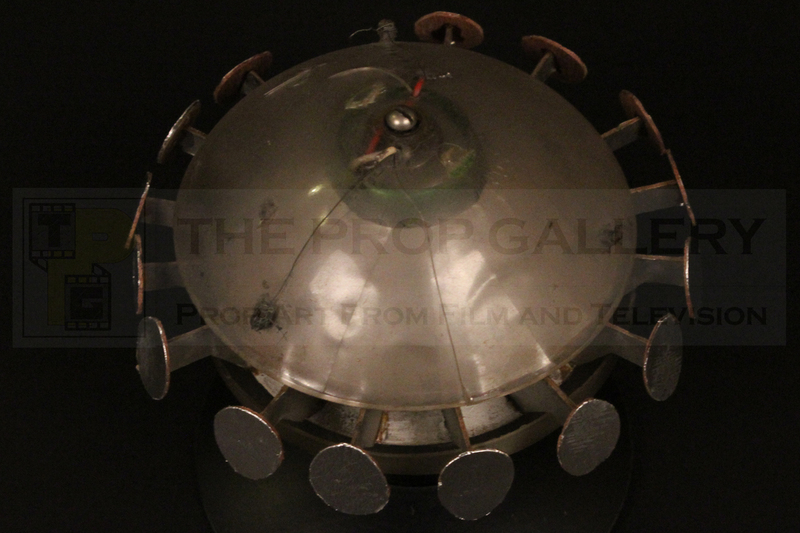 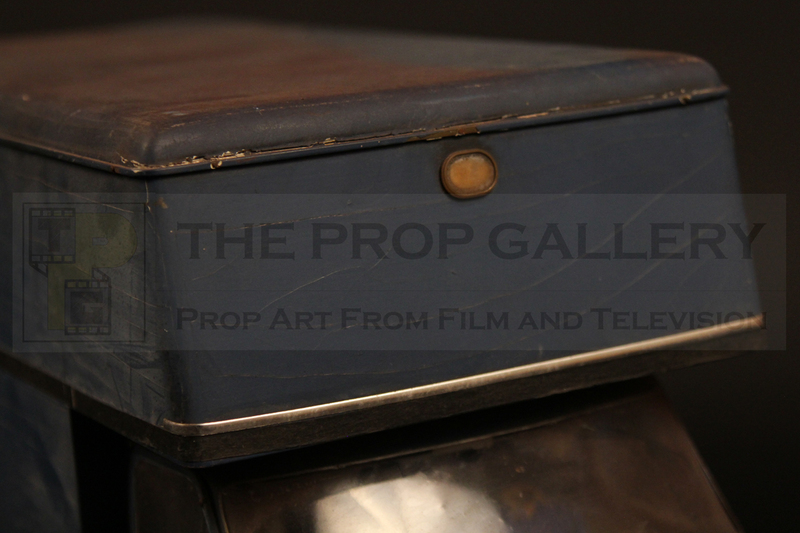 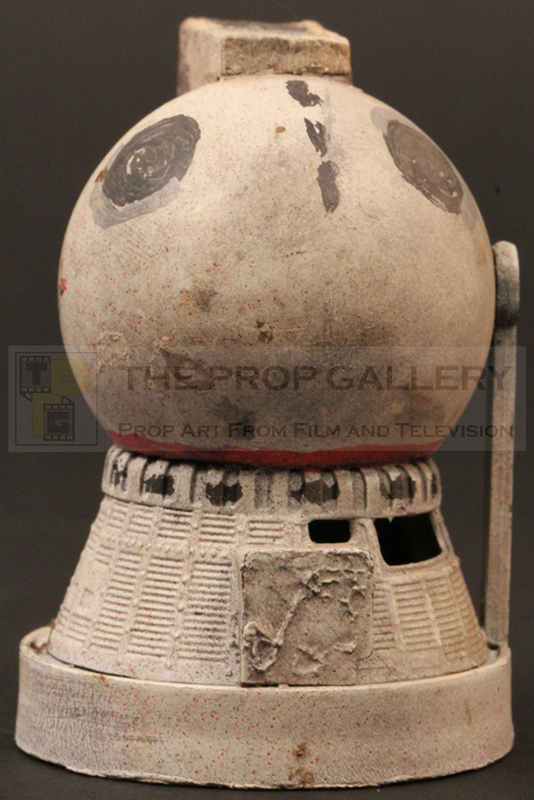 This particular model was used on screen in various episodes and is believed to be one of Meddings’ earlier examples of a UFO miniature, it represents one of only two studio used UFO models known to exist today. 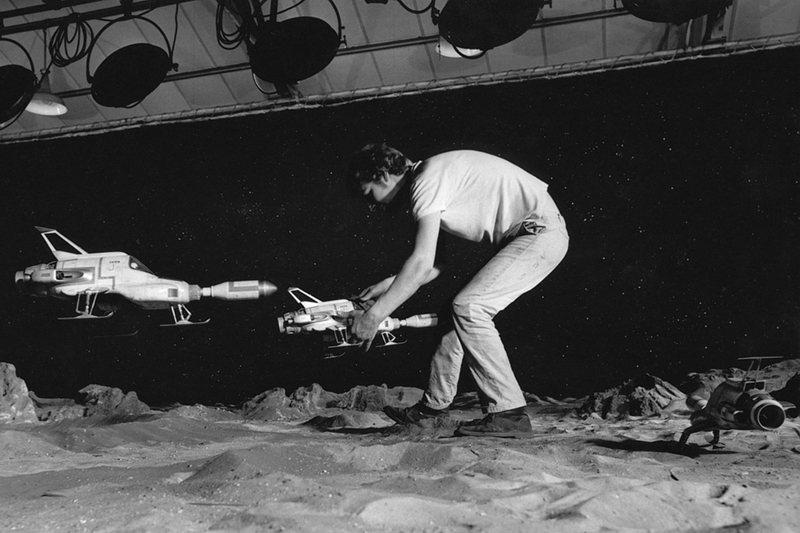 While there were constant issues during filming of the miniatures, notably its wobbliness and inability to fly in anything other than a straight line without the revolving action stopping, the UFO filming miniature is undoubtedly a classic Meddings design and a great example of his ingenuity in transforming a simple design into a complex and revolutionary miniature effect. 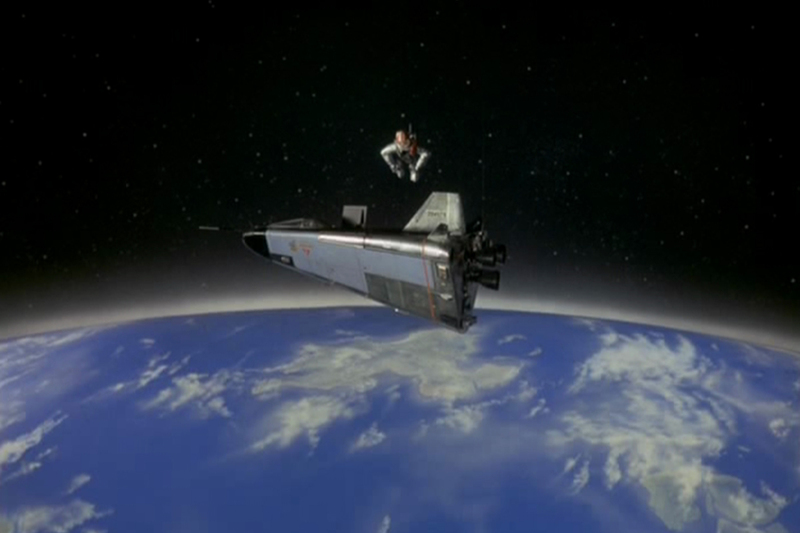 Arguably one of the most memorable aspects of the series is the Skydiver which represents SHADO’s defence within the Earth’s atmosphere. 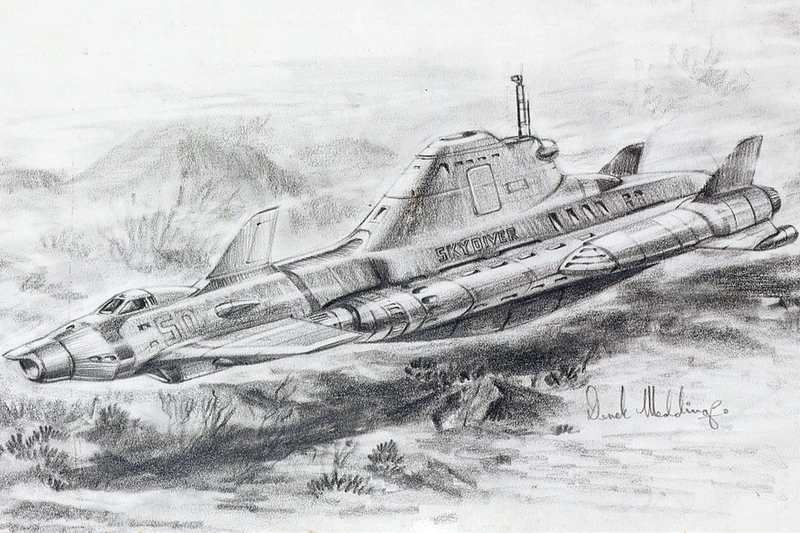 These nuclear powered submarines operate from under the ocean and include a detachable front section which can launch to become a single seater supersonic fighter aircraft equipped with missiles capable of neutralising threats from a UFO. 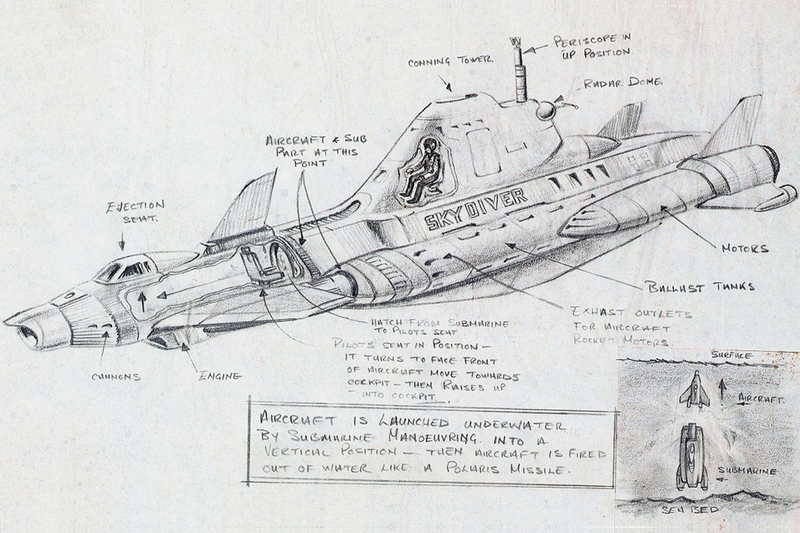 Skydiver and Sky One were designed by Derek Meddings with his heavily annotated concept drawing specifying where the two sections would separate and how the craft would launch. 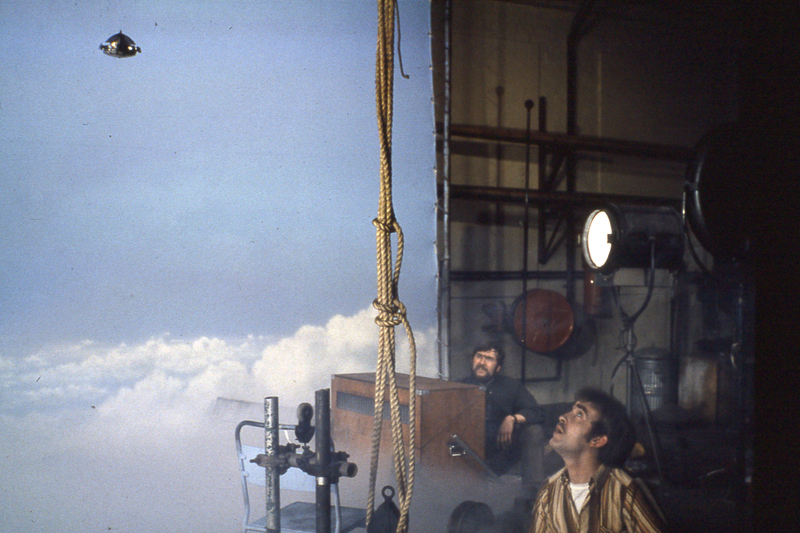 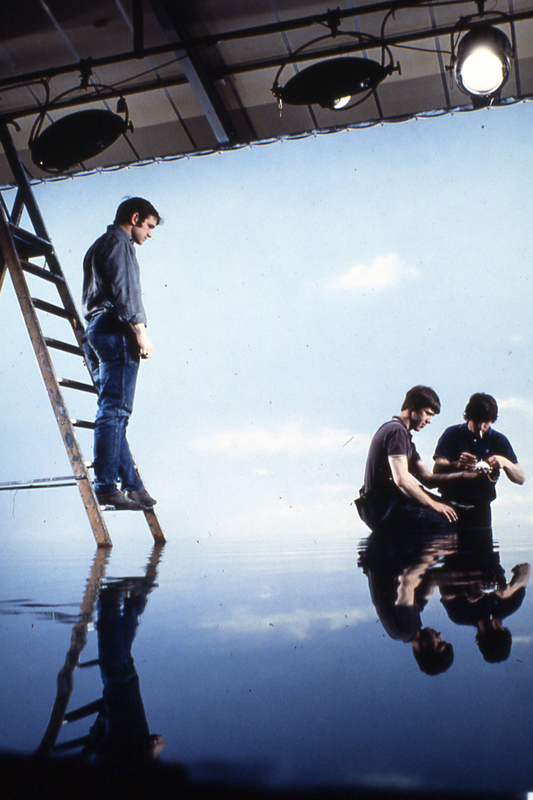 Meddings originally envisaged the Skydiver moving in to a vertical position for Sky One to launch but this was later revised to a 45 degree angle, possibly the simplify the filming of the miniatures. 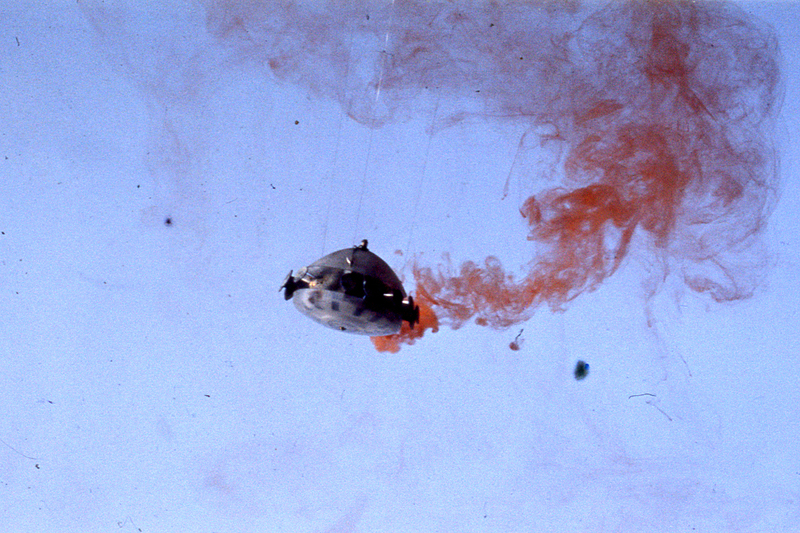 It is believed that the complete Skydiver was built in two scales measuring approximately 30” and 60”; in addition to this an independent large scale Sky One miniature was also built measuring 26” in length with a 24” wingspan. 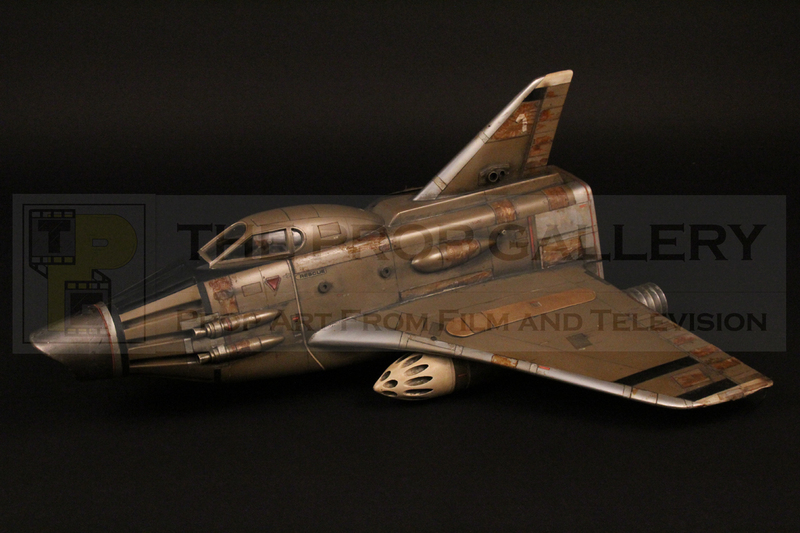 The Sky One miniature is beautifully crafted from fibreglass and is heavily detailed with numerous panel lines and decals as you would expect of a large scale miniature built to be filmed up close. 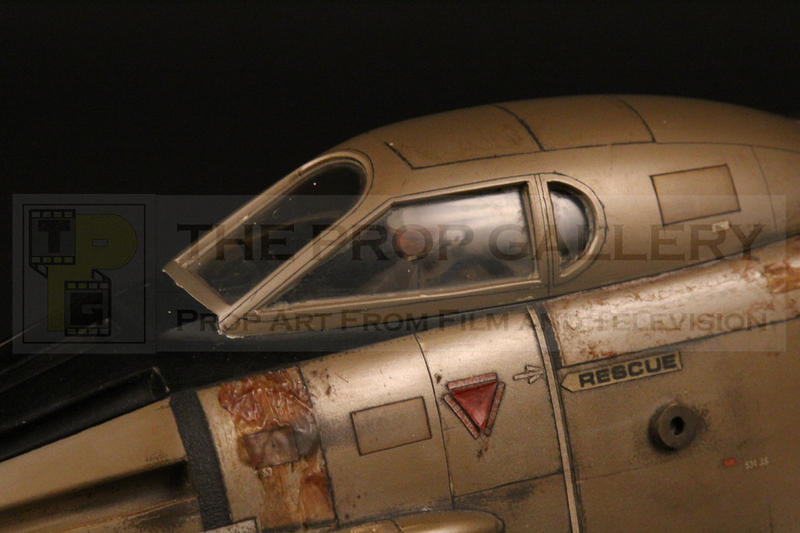 Such is the level of detail the pilot even sports an accurate helmet, harness and SHADO logo on his clothing, lights were also fitted to the wing tips for night time shots with the wiring that powered these still remaining today. 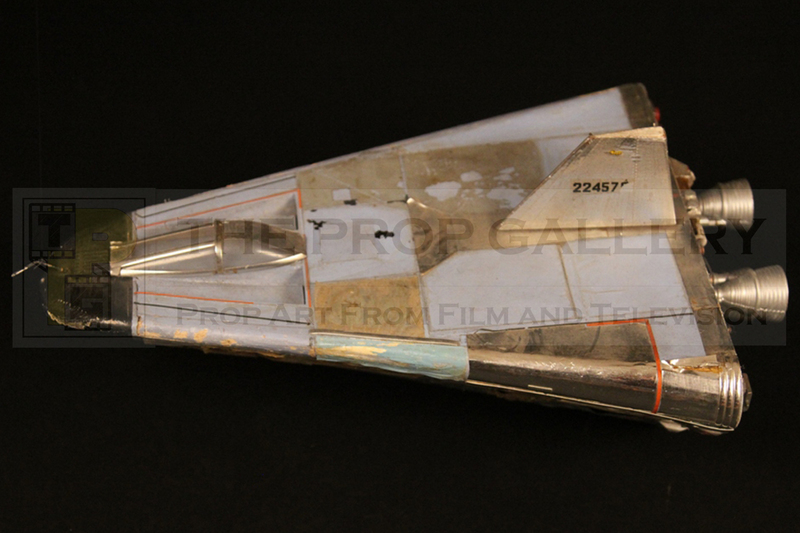 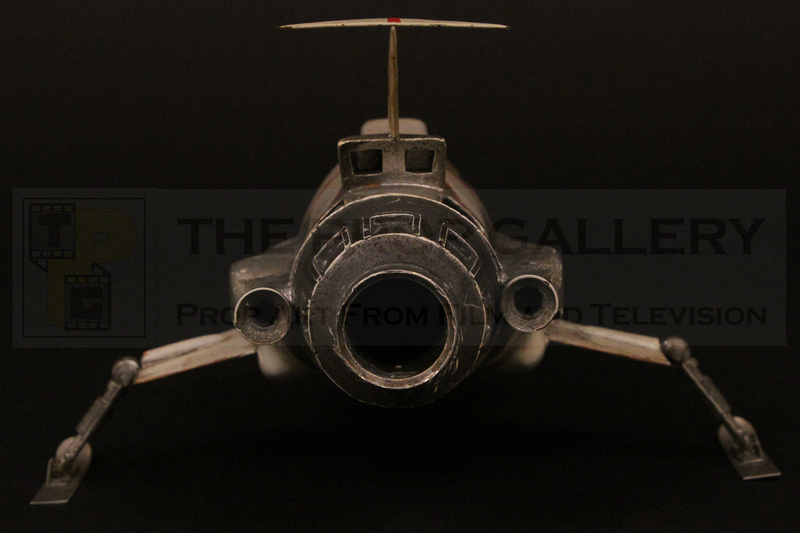 This is the very model seen held by Derek Meddings and Ken Holt in the famous photograph taken in the Century 21 model store, it represents the only example of an original Sky One filming miniature known to exist today and an incredibly important and recognisable artefact from the series. 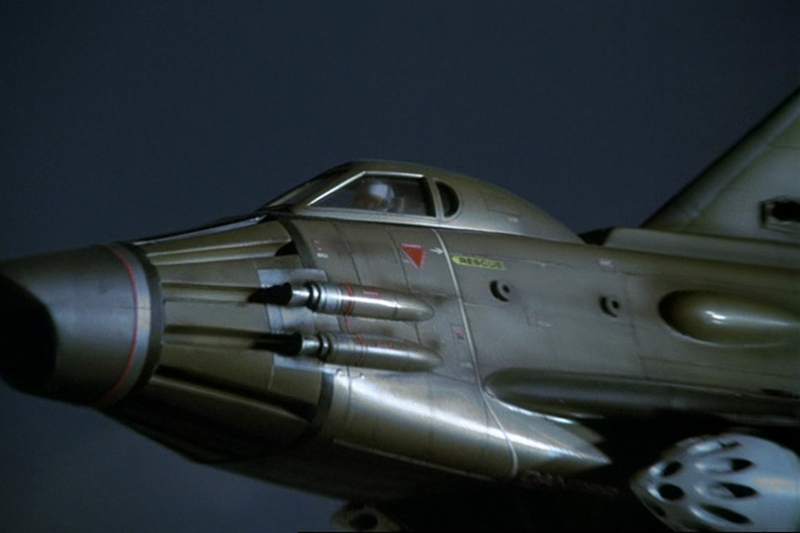 Another memorable element of the series is the Moonbase Interceptor which provided the first line of defence against alien invasion. 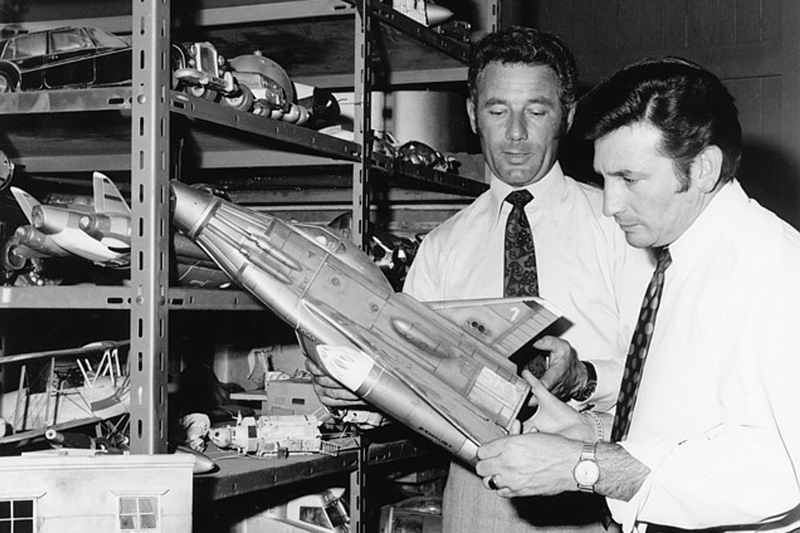 It was Mike Trim who was assigned to design the craft and drawing influence from script notes and real NASA spacecraft created a concept for the Interceptor with only one solitary missile and landing skis. 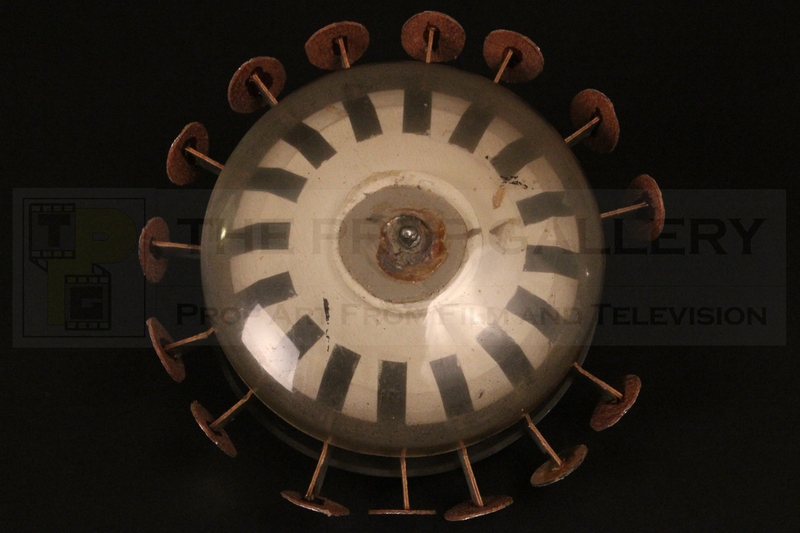 This initial design was subsequently fettled by Meddings who added his futuristic touch while retaining many of the features conceptualised by Trim, his final design bearing notes stating that there were to be just three which were to be housed in natural Moon craters around the base. 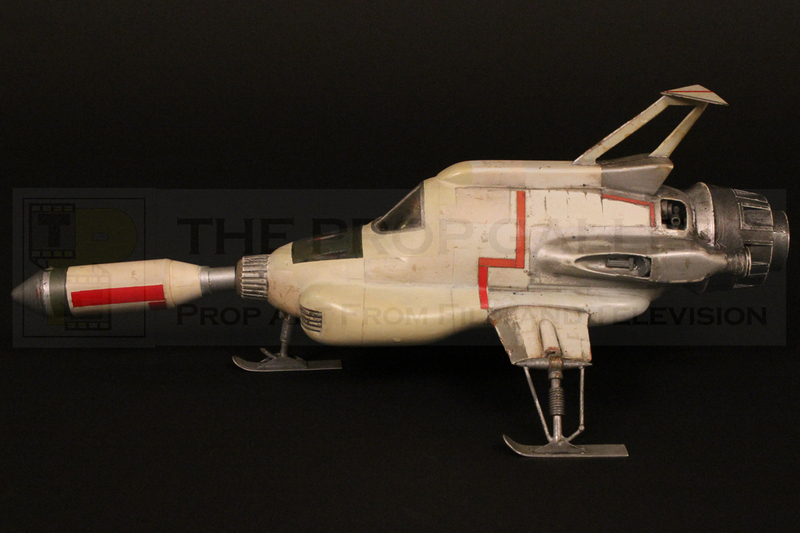 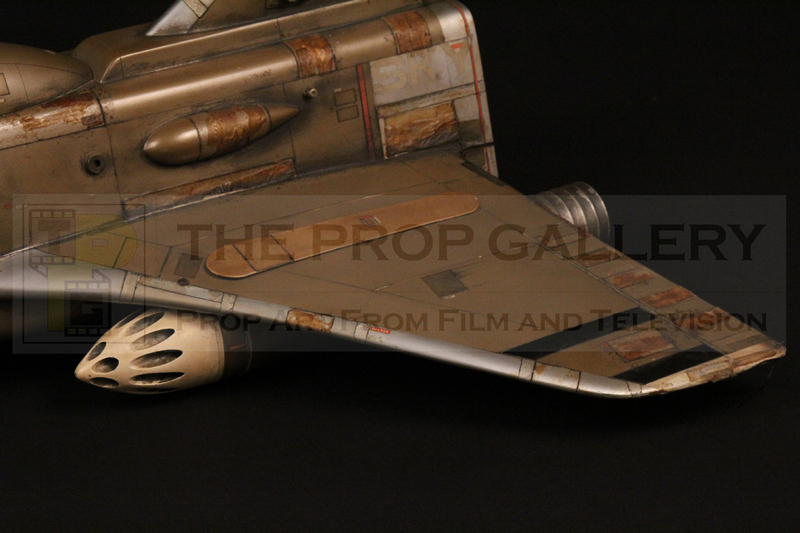 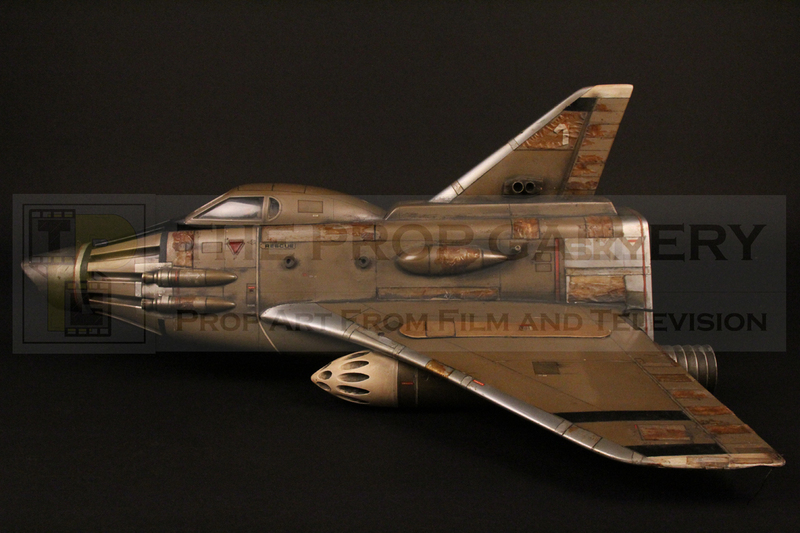 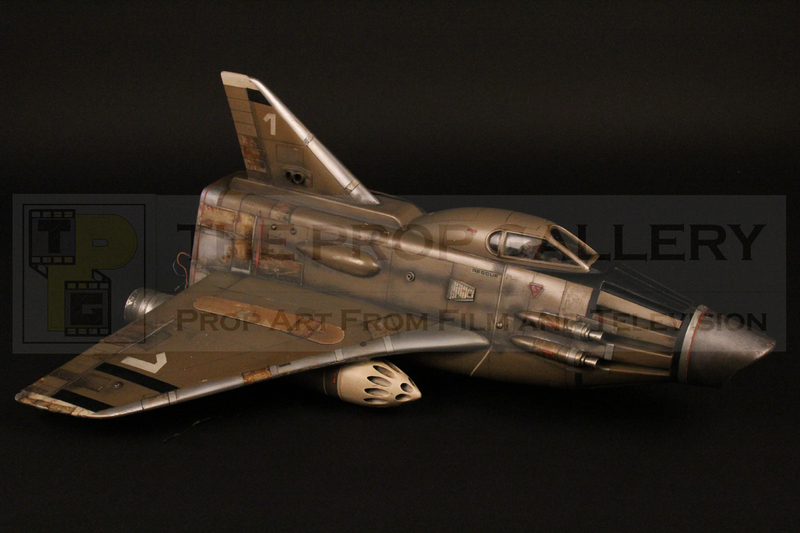 The Interceptor miniatures were created for production in two scales measuring approximately 13” and 25” respectively. 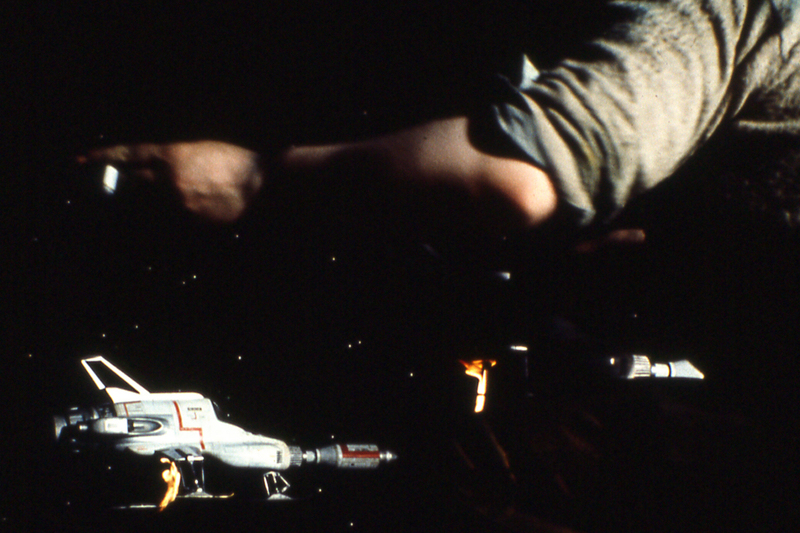 Of these only two original screen used filming miniatures are known to exist today, one in each scale. 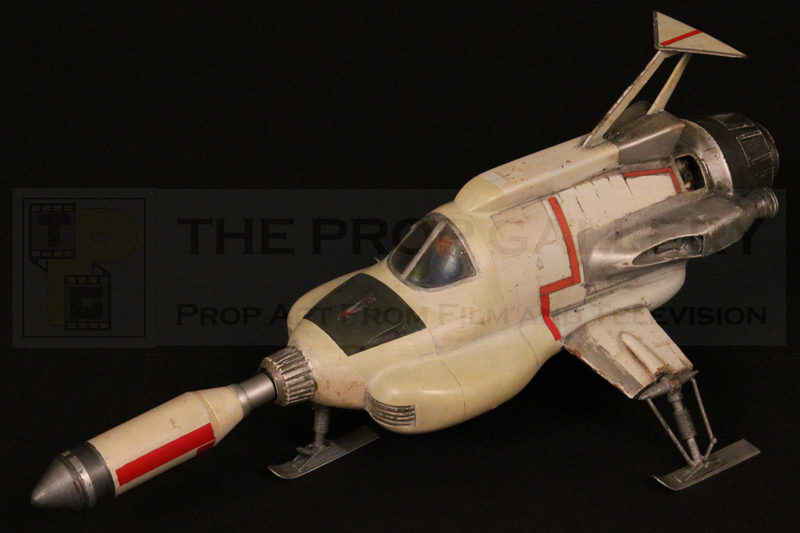 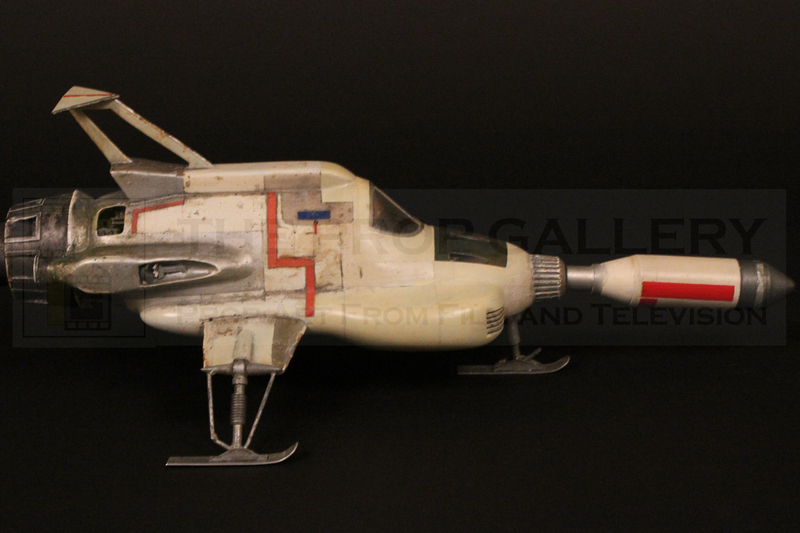 This represents the smaller of the two miniatures, constructed in slush cast resin with metal landing skis and detachable missile, the model is detailed with hand applied decals and even sported a pilot to the cockpit interior. 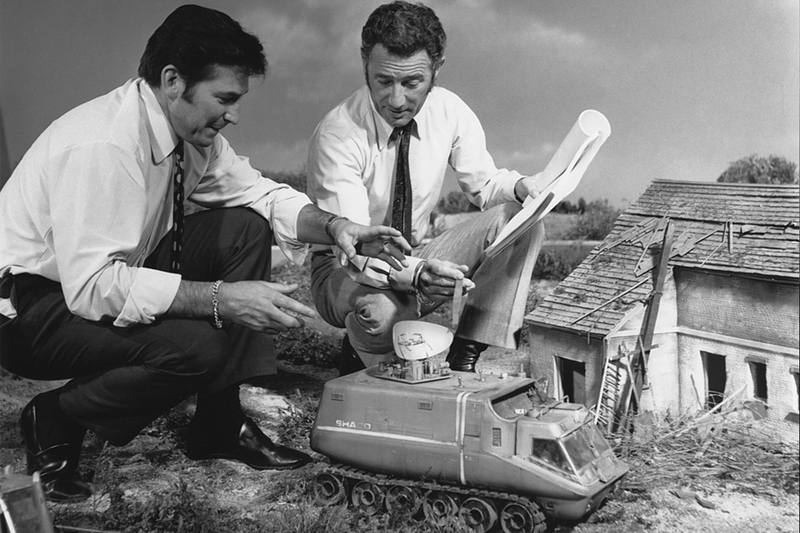 The design was imortalised forever when the Dinky Toys 351 UFO Interceptor release of 1971 hit the shelves, interestingly we owe it to Dinky that this very miniature survives today as it was given to them by Century 21 in an attempt to ensure the accuracy of the model, to this day we are not quite sure what went wrong. 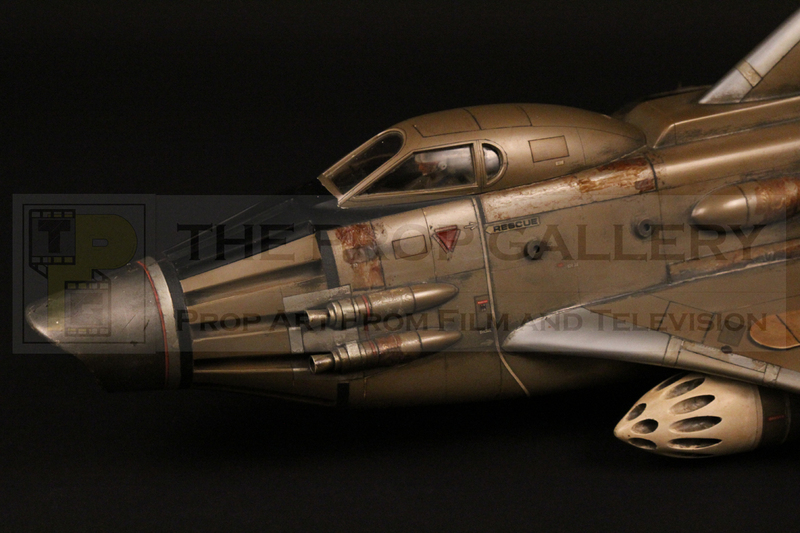 Regardless of various criticisms on their functionality and use, such as only having one missile, the Interceptor remains a fantastic piece of design and an iconic and instantly recognisable element of the series. 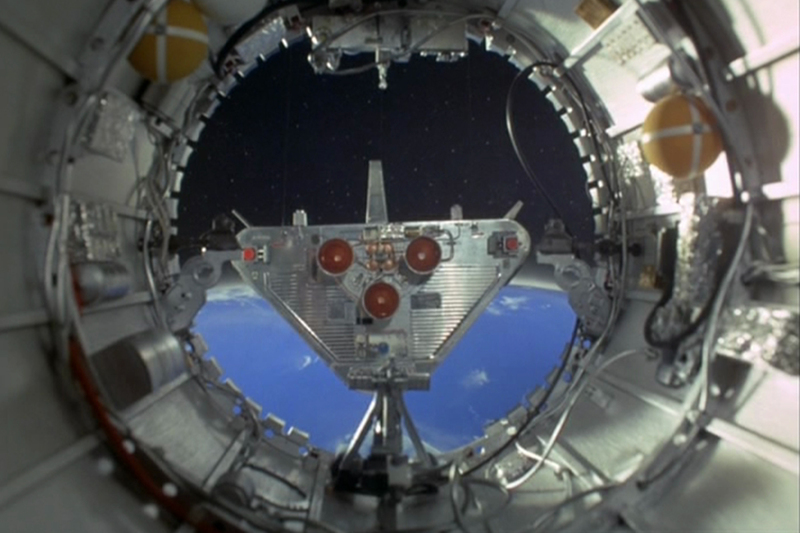 The SID or Space Intruder Detector is an unmanned satellite controlled by an on board computer which detects approaching UFO and can communicate with the SHADO Moonbase to warn of incoming attack. 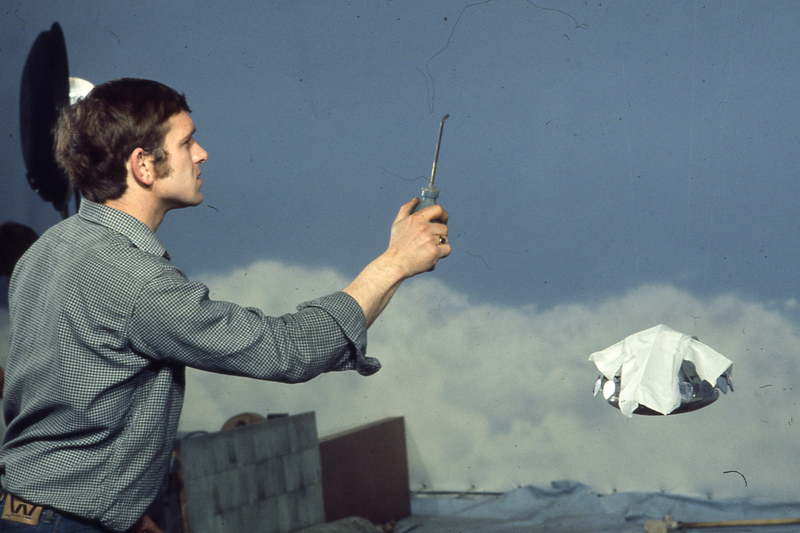 The SID was designed by Mike Trim on clear instruction from Derek Meddings who envisaged an insect like design which he realised beutifully creating yet another memorable and important elemnet of the series. 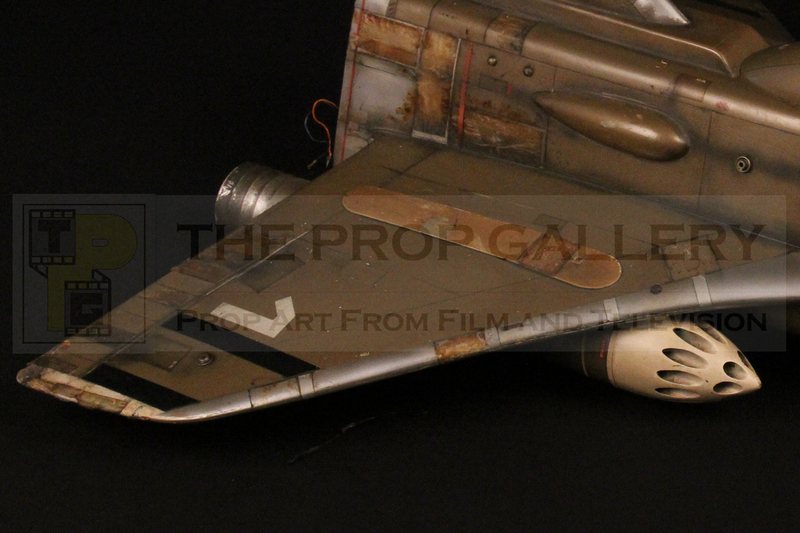 For filming requirements the SID was created in two scales, a large miniature used for close up shots and a smaller, less detailed, model for longer shots, this miniature can clearly be seen in the famous shot of Derek Meddings and Ken Holt in the Century 21 model store. 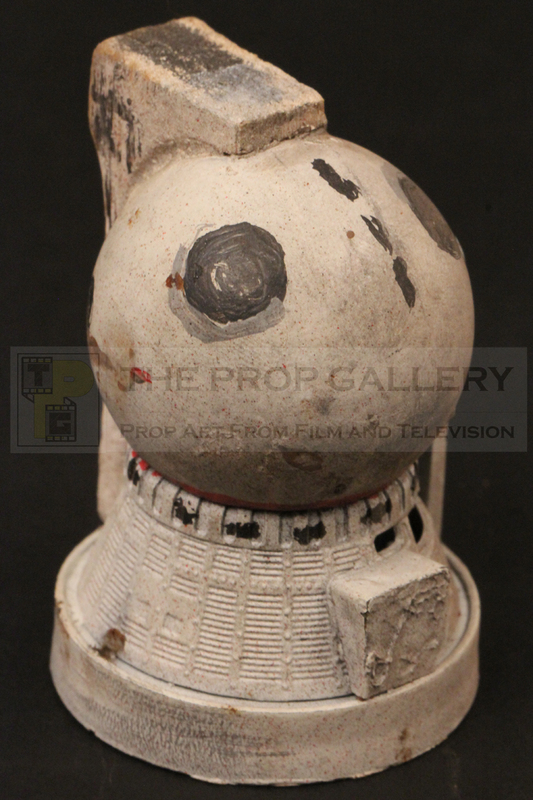 This front section is from that smaller miniature and is believed to be all that survives of the model, constructed from a ping pong ball and carved jelutong wood the piece is hand detailed with pen. 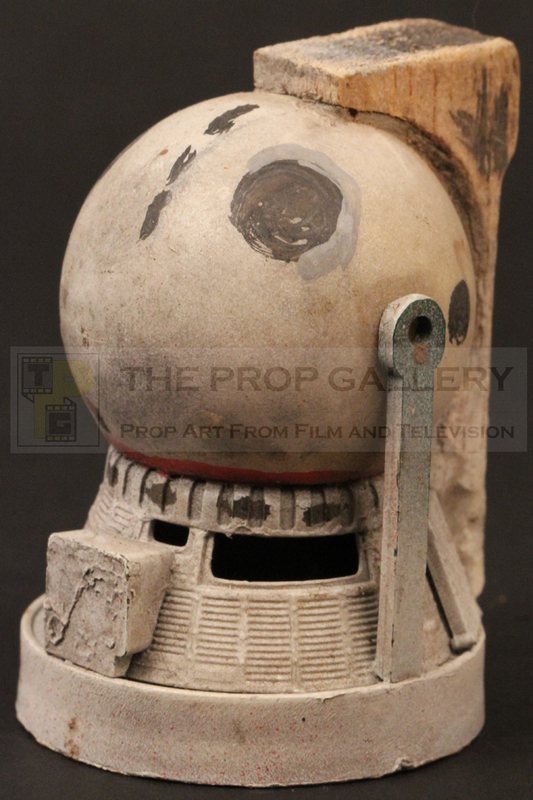 The fate of the larger SID filming miniature remains unknown, presumed destroyed, making this a rare artefact and very possibly the last surviving part of the studio used SID miniatures. 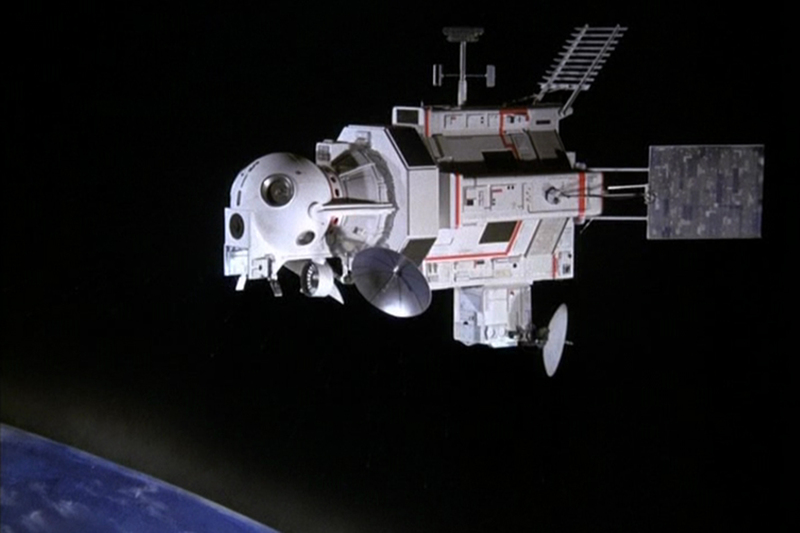 The SID 2 shuttle was ulitlised in The Man Who Came Back, carrying Commander Straker and the brainwashed Collins to the SID to carry our repair work. 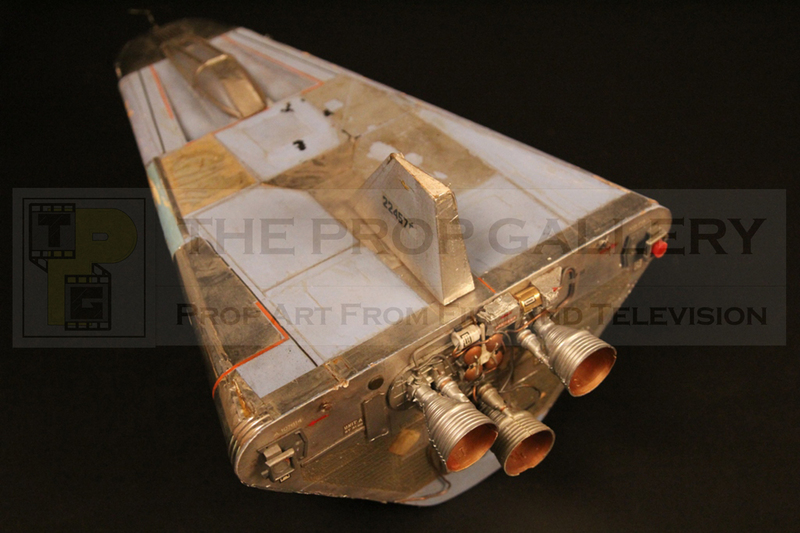 The shuttle was designed once again by Mike Trim and was based on a real NASA lifting body of the period. 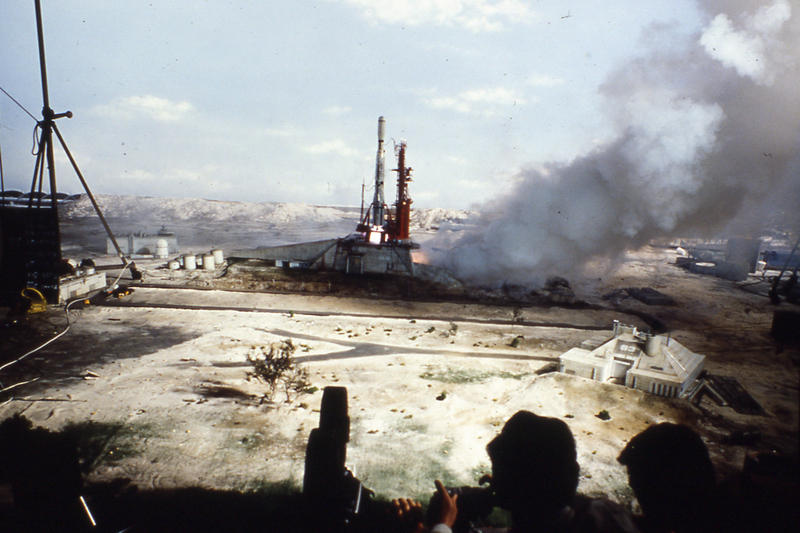 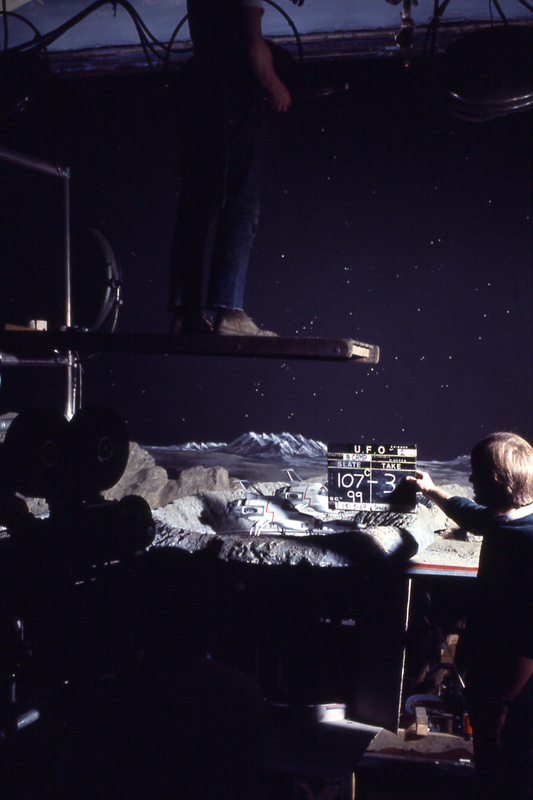 This filming miniature is the only one made by Century 21 for the production, measuring approximately 14” long it was filmed alongside the large scale SID miniature. 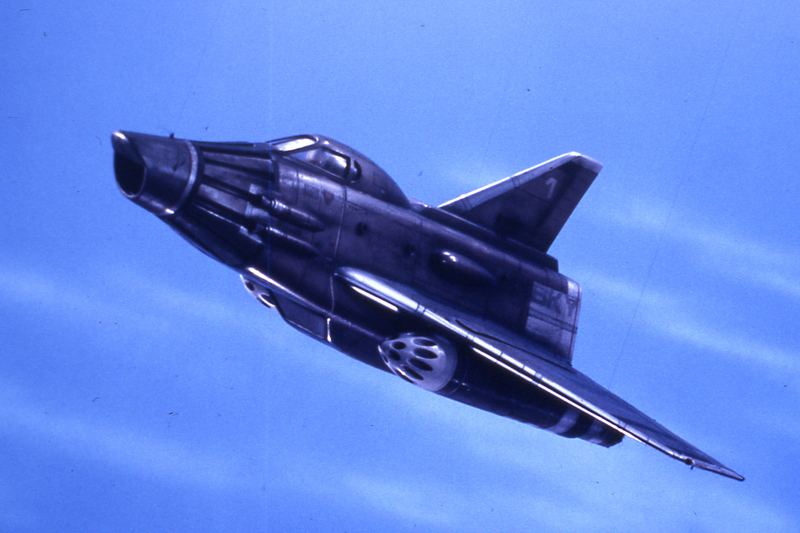 Constructed from carved wood with cockpit to the front and rear fin the body has been decorated with various reflective material. 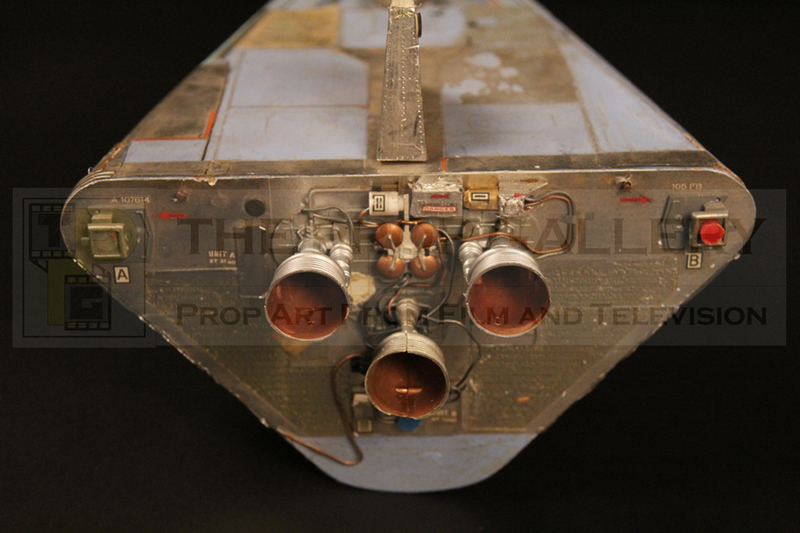 With the rear of the miniature featuring in close up on screen it is heavily detailed with a number of kit parts, intricate wire work and hand applied decals and is an excellent example of the attention to detail which made Century 21’s model effects so spectacular. 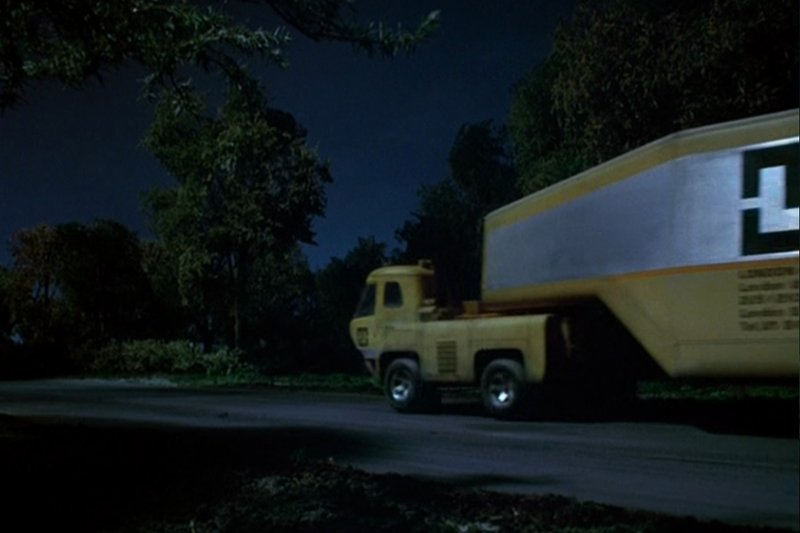 The Markers Universal Transporter is a large lorry like vehicle which is used to transport the SHADO Mobiles to their destinations. 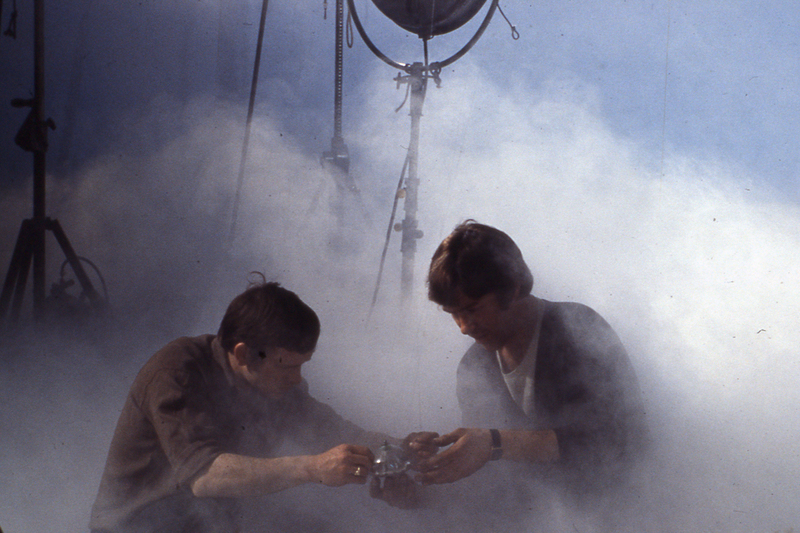 First appearing in The Square Triangle in some of the series’ most beautifully shot miniature effects sequences and favourites of Derek Meddings who enjoyed the challenge of creating the realism required for the Earth based model shots. 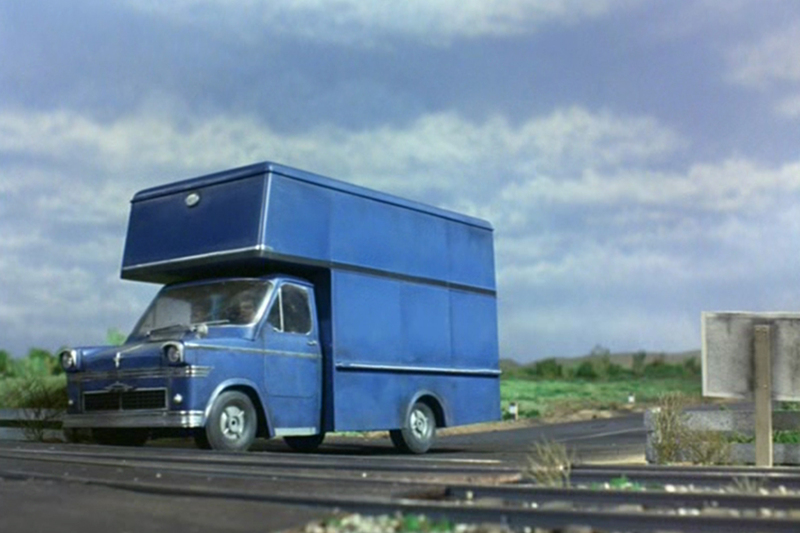 The tractor unit makes its next appearance in Court Martial as the truck with which Straker almost has an accident, this time towing a low loader style trailer with two identical vehicles as its cargo, these vehicles were actually hovertruck miniatures which were used extensively in previous Anderson series Joe 90, featuring in several episodes. 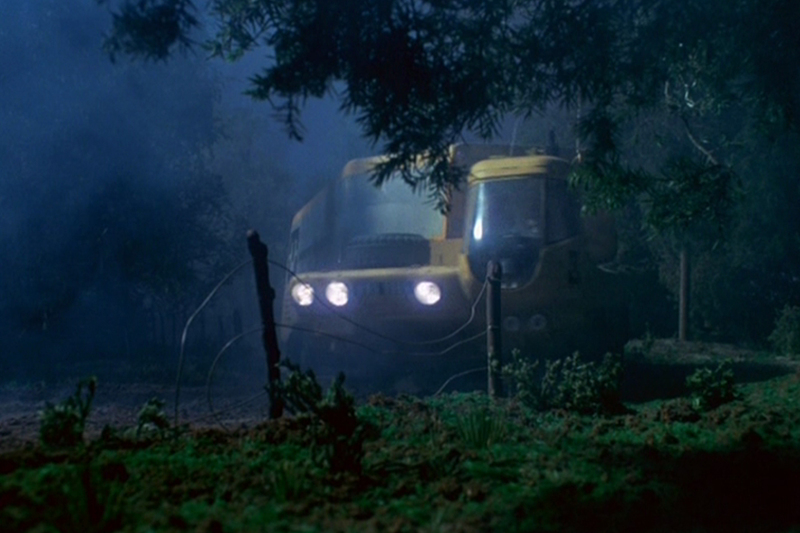 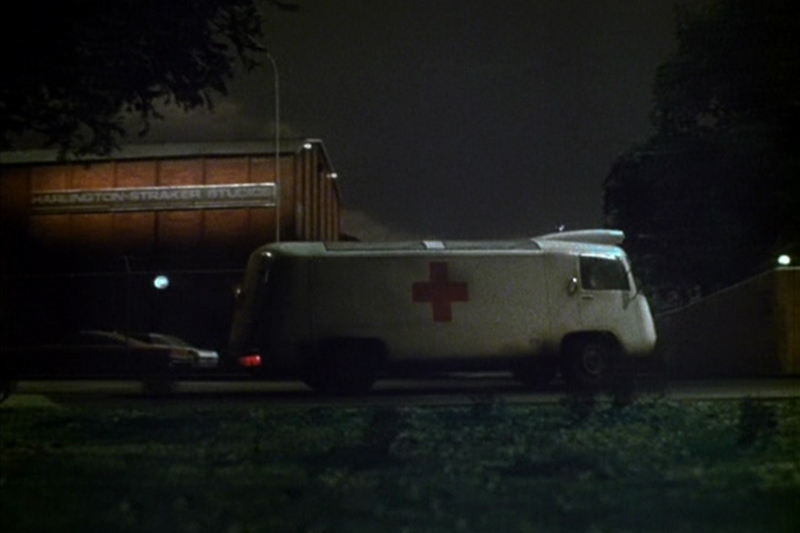 The vehicle was also used in the episode E.S.P back to its Square Triangle appearance towing the Markers Universal livery trailer containing a SHADO Mobile. 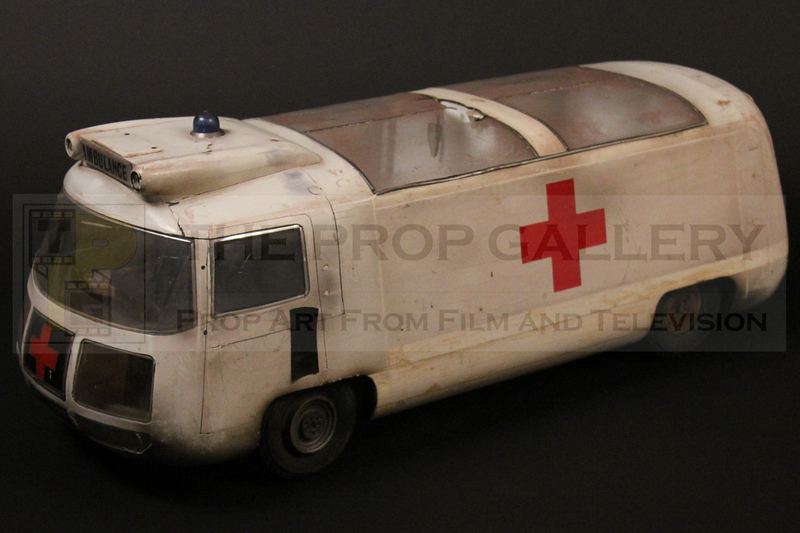 Once again designed by Mike Trim, the Markers Transporters were built in miniature by the talented Century 21 model team in large scale for use on the massive model sets required to generate such realism. 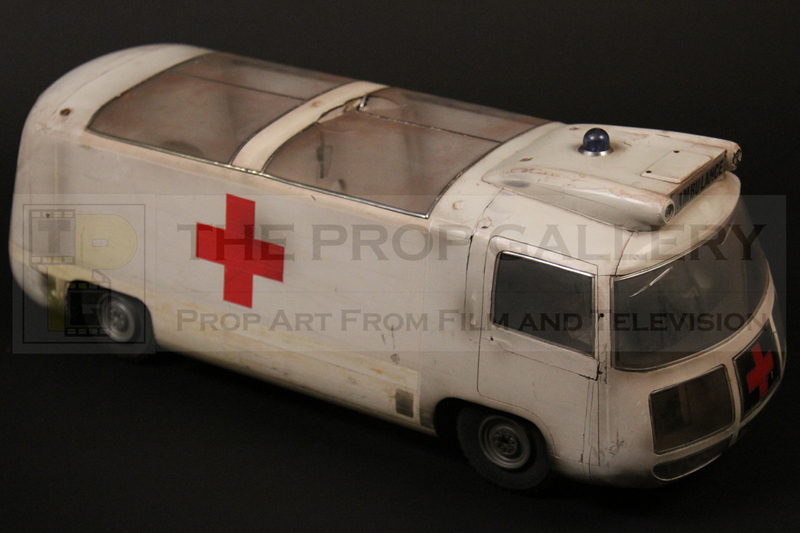 It is believed that three complete transporters were created for filming, with the tractor unit measuring approximately 19” in length the complete transporters with trailers must have been quite a spectacle approaching five feet long. 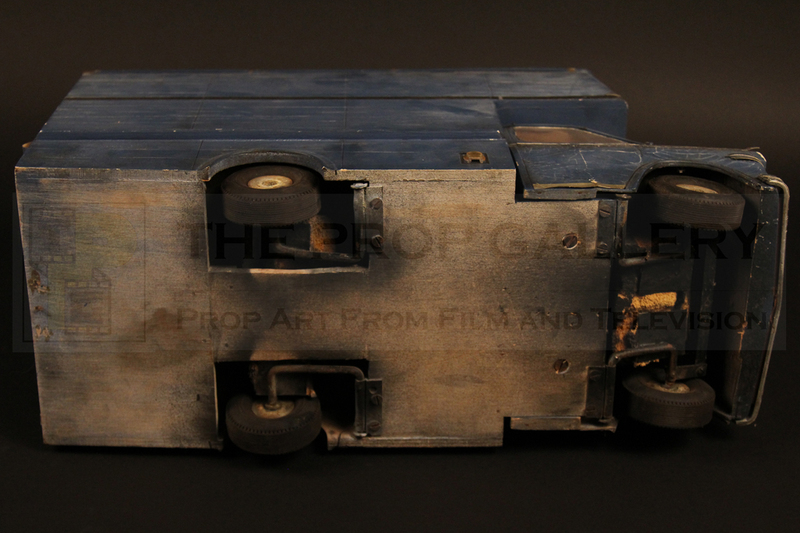 Constructed in carved wood built upon a suspension system used on many Century 21 filming miniatures of the period that was devised by Derek Meddings, this incorporated foam under the axles allowing the model to bounce slightly resulting in very realistic movement on screen. 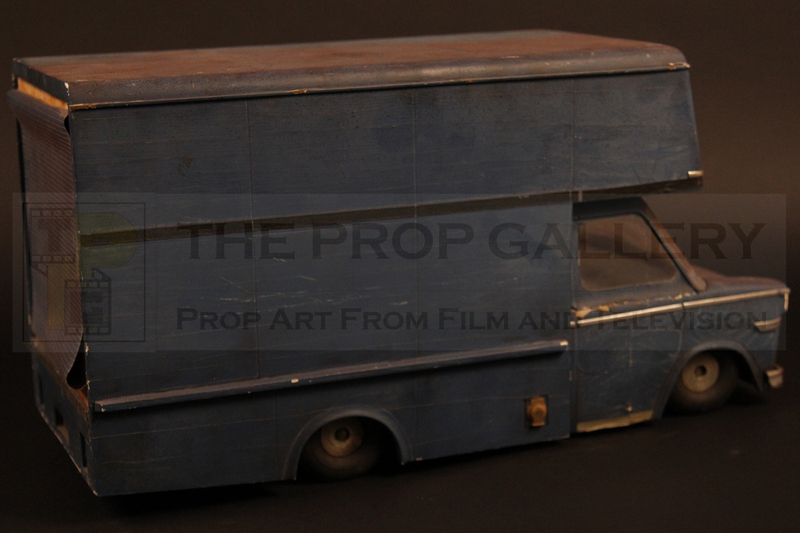 Such is the detail on this miniature the rear axle suspension is spring loaded resulting in the rear of the tractor unit standing slightly higher than the front, this would have been counteracted by the weight of the trailer again providing great realism on screen. 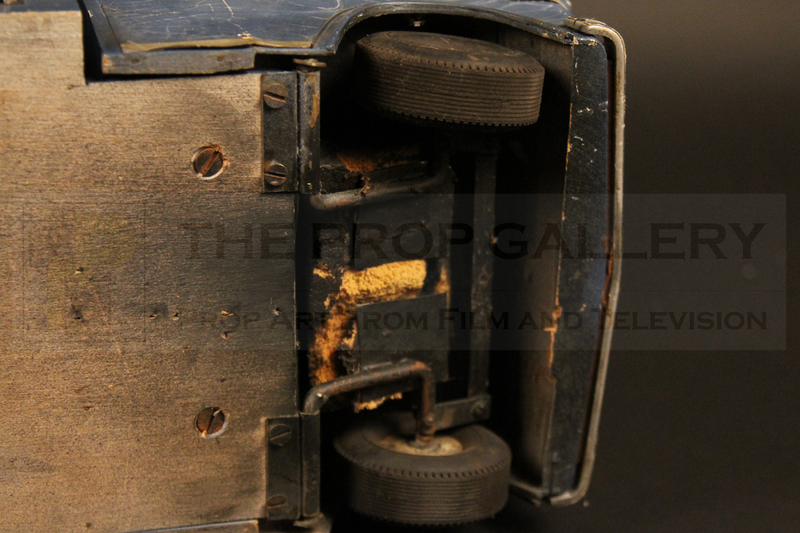 The miniature features a cab fabricated in wood and heat formed acrylic with residue to the interior where the driver once sat with the back of the model dressed with an exhaust and various detailing and a locating hole where the trailers could be attached. 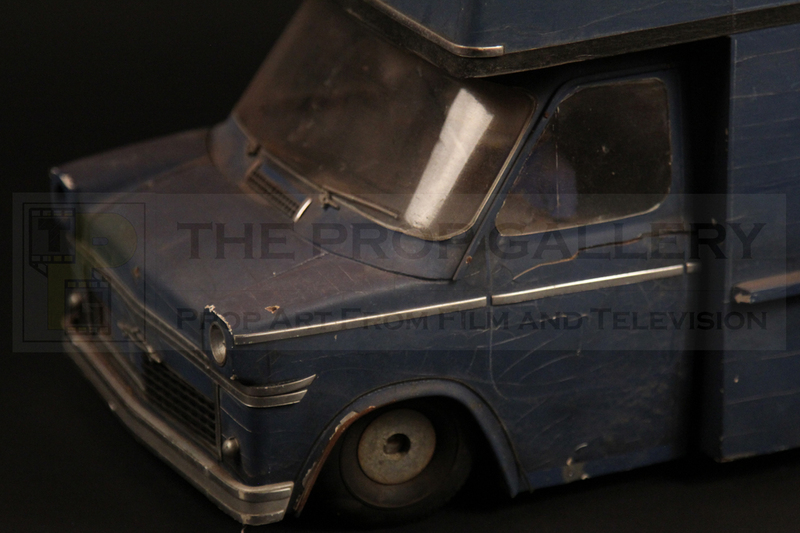 The front of the model features two hooks that would have been used for towing the vehicle during filming and three headlights which are wired to light and remain operational to this day; these are controlled by a switch which can be seen next to the spare wheel to the side of the cab. 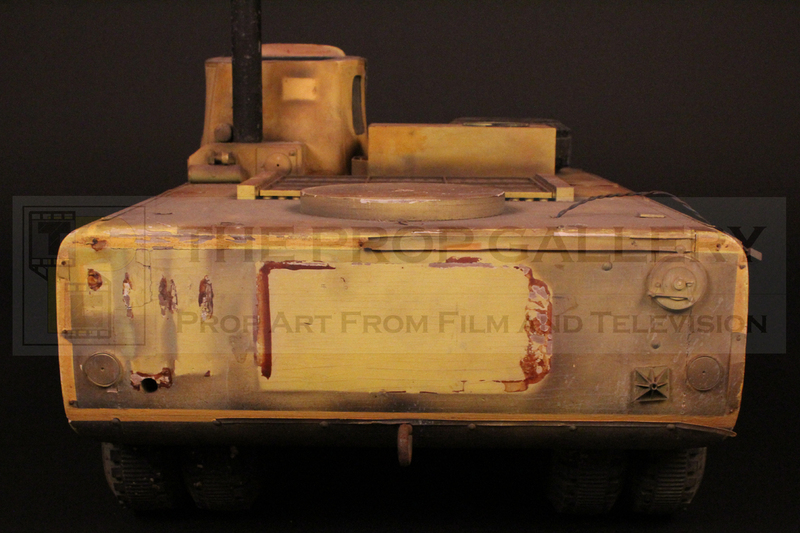 Various decals, side grills and a dirtied down weathered paint job finish this incredibly detailed large scale filming miniature which represents the only example known to survive today. 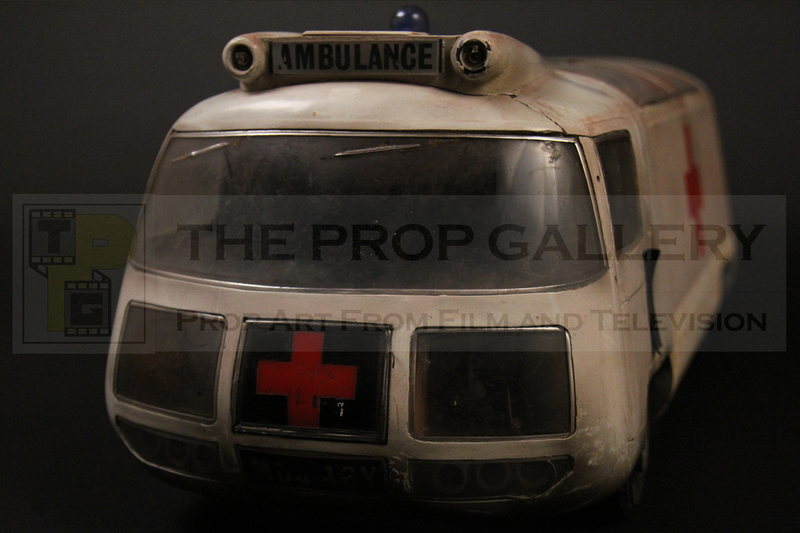 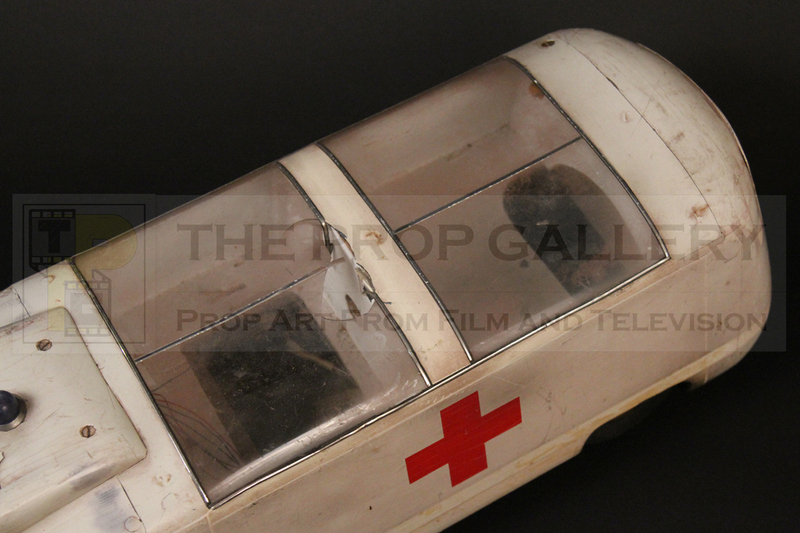 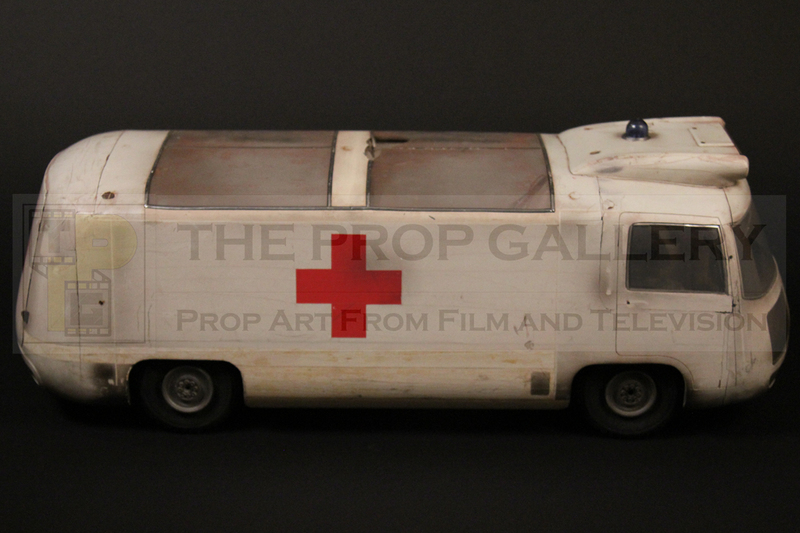 This futuristic SHADO ambulance was used in two episodes, firstly in series opener Identified where it is used to transport the alien and again in Flight Path. 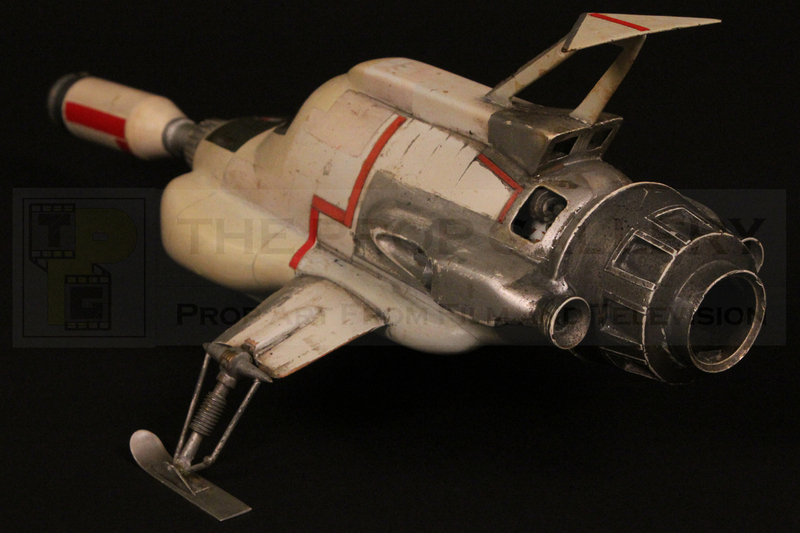 The futuristic design, a trademark of Anderson productions, is once again that of prolific designer Mike Trim which was beautifully realised in miniature by the skilled Century 21 model makers. 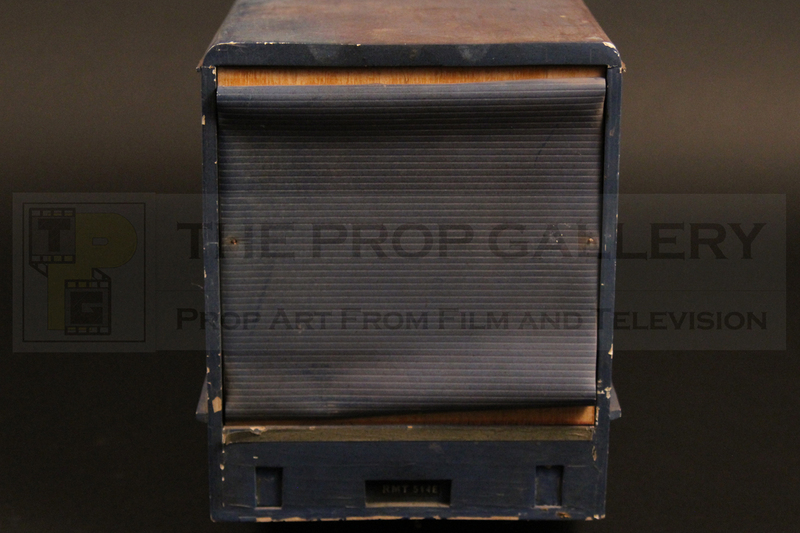 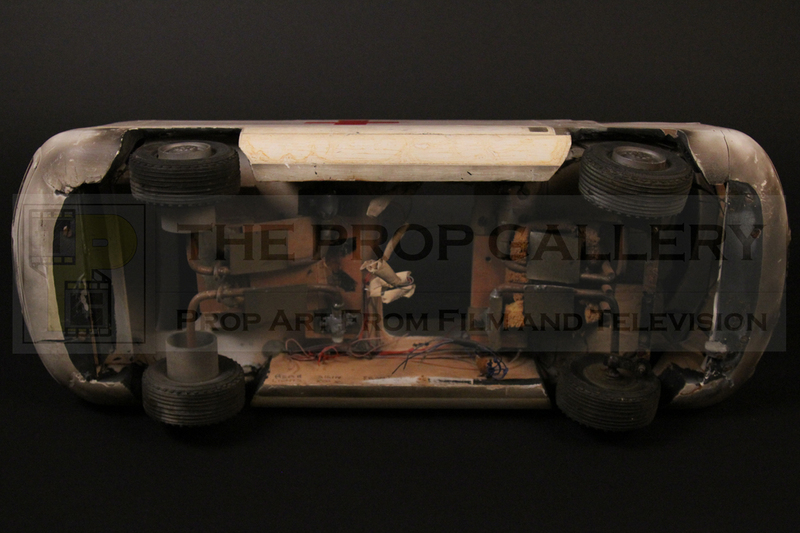 This filming miniature is presumed the only one created for production, built in large scale it measures approximately 23” in length and 9” wide. 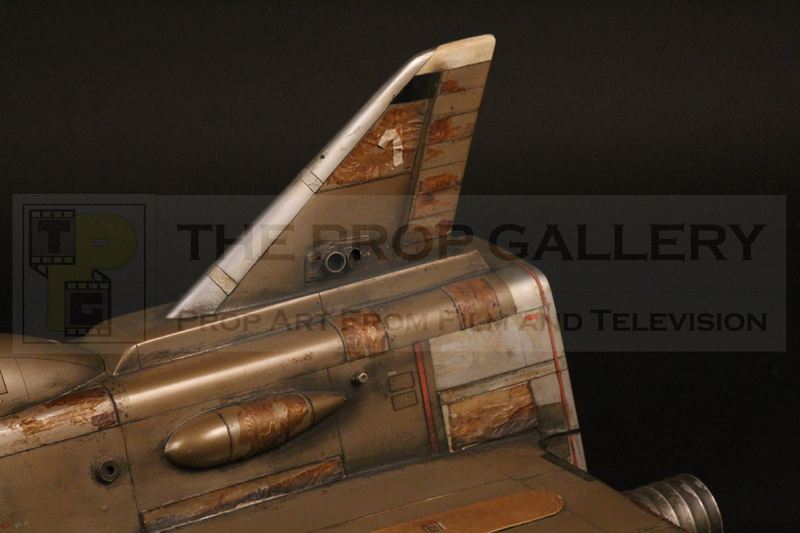 The incredibly detailed model is created from mixed materials with the main body constructed from a combination of jelutong wood and heat formed acrylic. 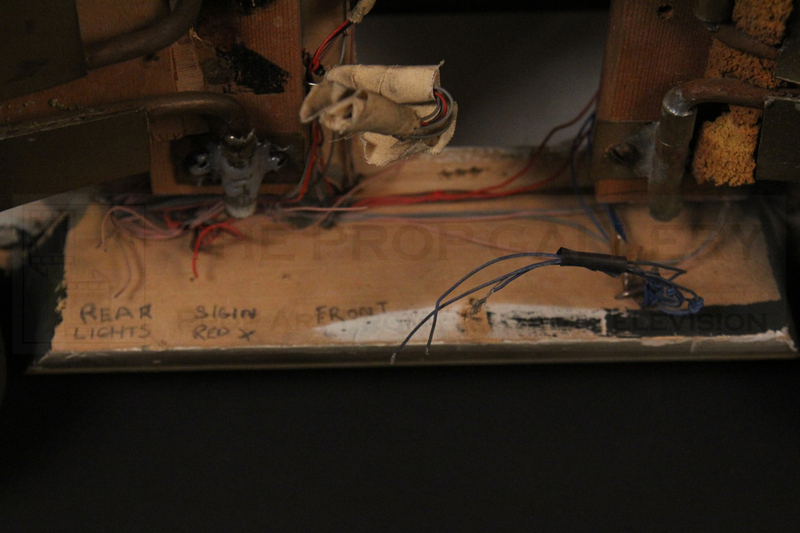 The model is once again built upon the Meddings designed suspension system and features front, rear and top lights are all wired to light with this wiring still complete and visible from the underside. 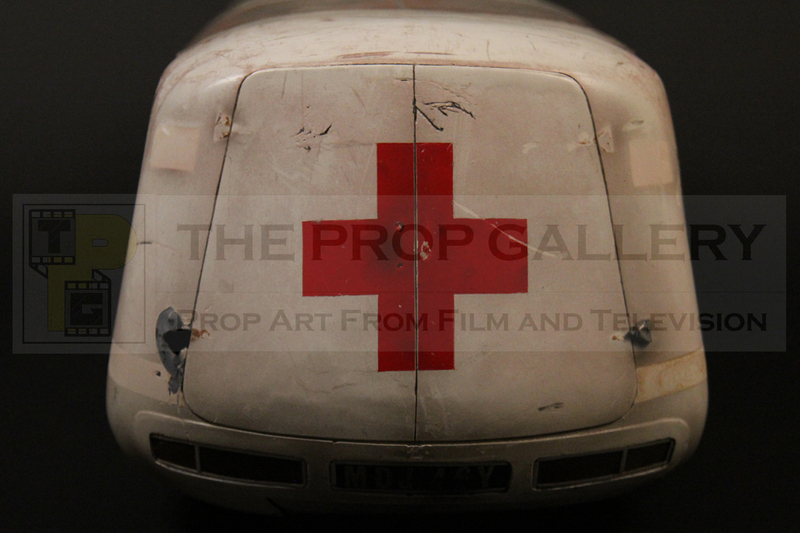 Other features include rubber tyres as seen on a number of Anderson vehicles in addition to grills and even wipers to the front screen and door hinges on the non-working rear doors, once again a testament to the incredible build quality and detail of Century 21’s model miniatures. 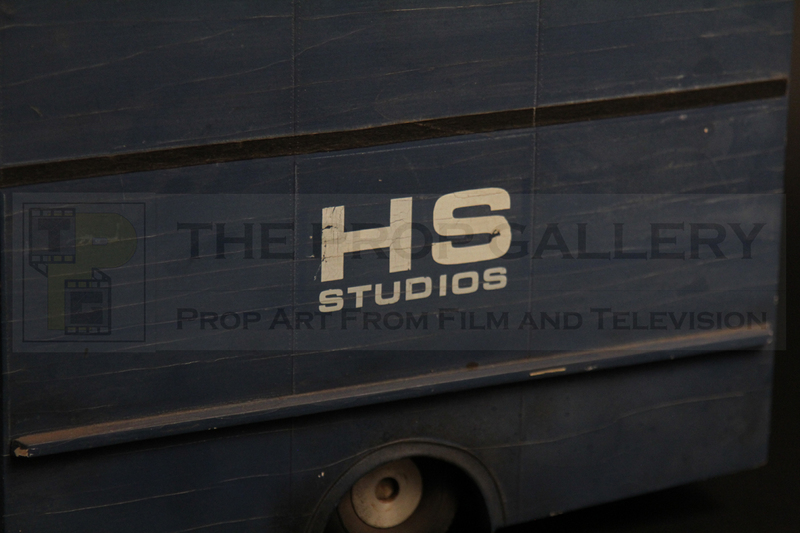 This Harlington Straker Studios van was first used in the series opener Identified where is can be seen parked behind the studios sign, this became an insert shot which was used in other episodes of the series. 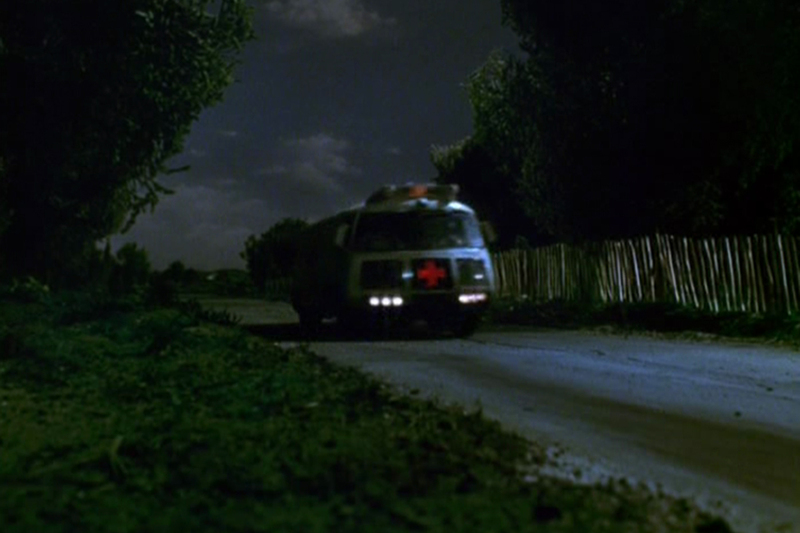 The van was originally built by Century 21 for Anderson’s previous series The Secret Service where it was used in the episode Last Train to Bufflers Halt as a getaway vehicle. 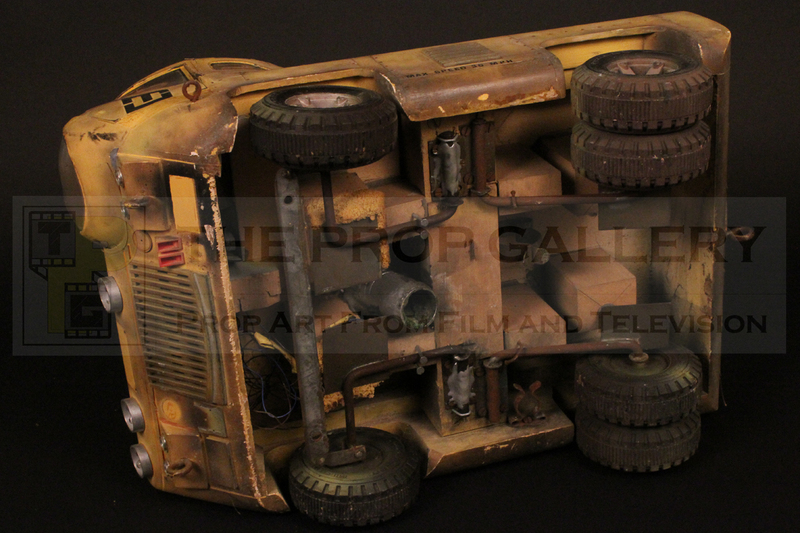 The large 18” miniature is constructed from mixed materials and is entirely hand made with the main structure of the model being wood and the cab section of heat formed acrylic atop the classic sprung suspension system. 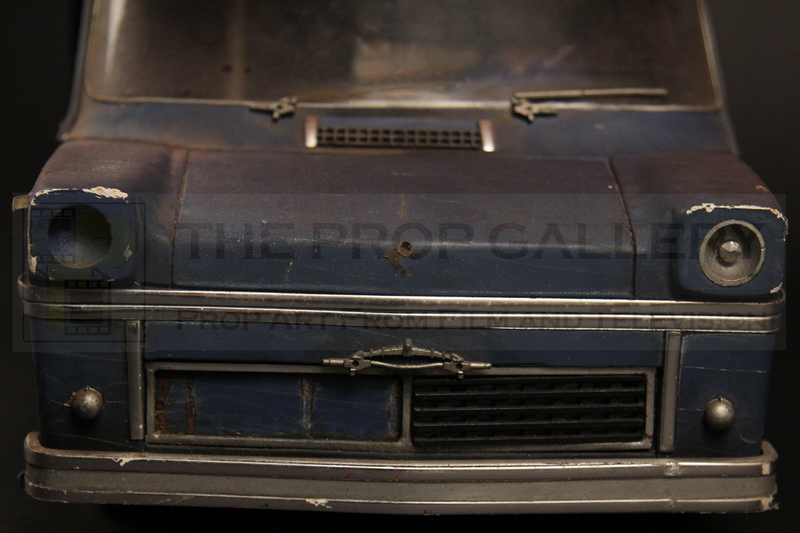 This incredibly detailed model has grills to the front with metal headlamps, bumpers and even a fuel cap. 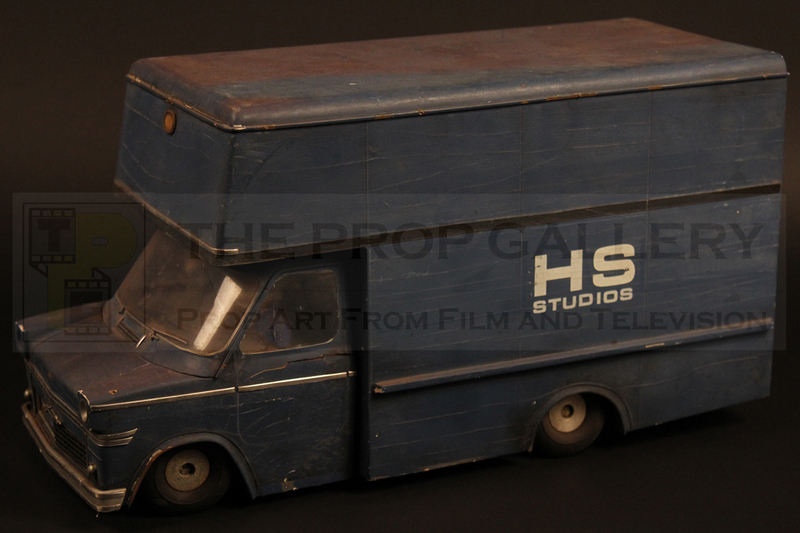 To the rear a piece of vinyl creates the impression of a door and the van also sports a number plate with the suffix letter being E dating the van to 1967, once again a true testament to the quality and accuracy of Anderson miniatures. 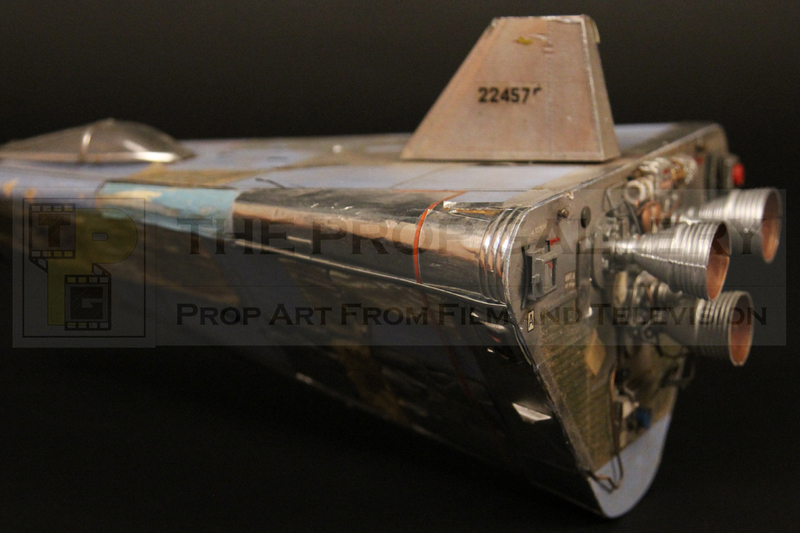 A H.S STUDIOS graphic is applied making this instantly identifiable as a UFO miniature, the graphic is applied on one side only, often a feature of Century 21 models where they were only planned to be shot from a specific angle. 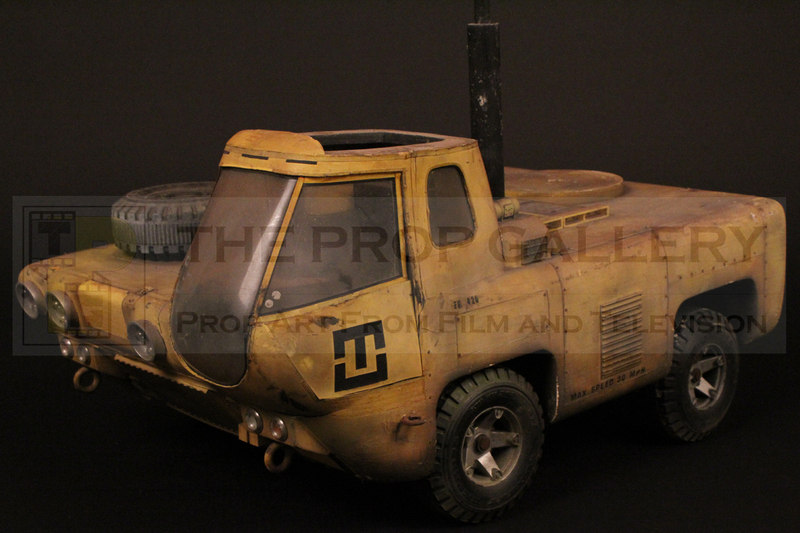 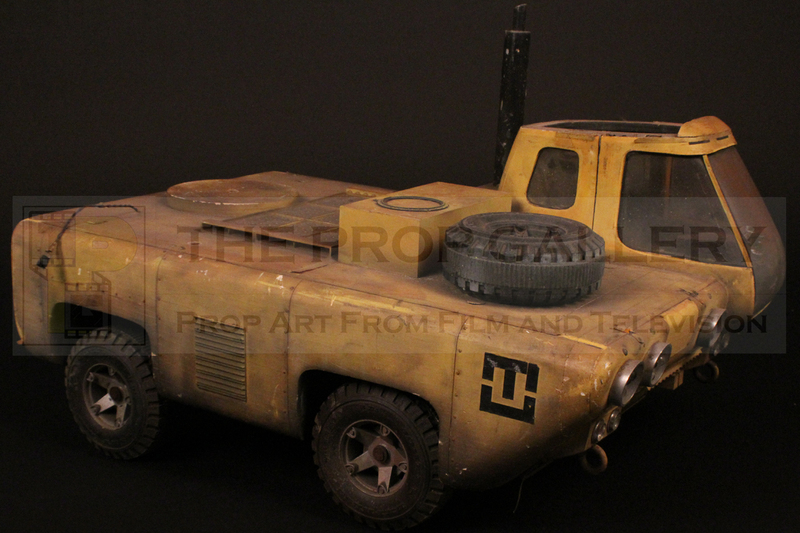 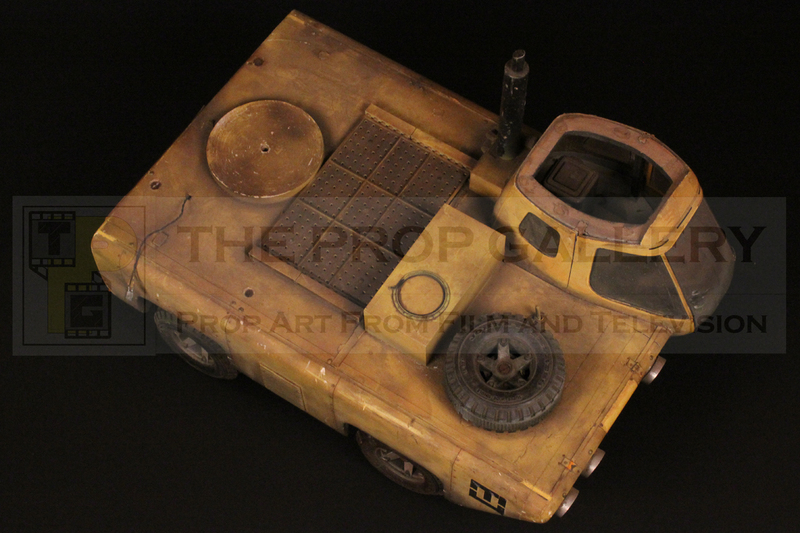 This represents a unique vehicle from the series and one of only three Earth based original studio used filming miniatures known to survive today. 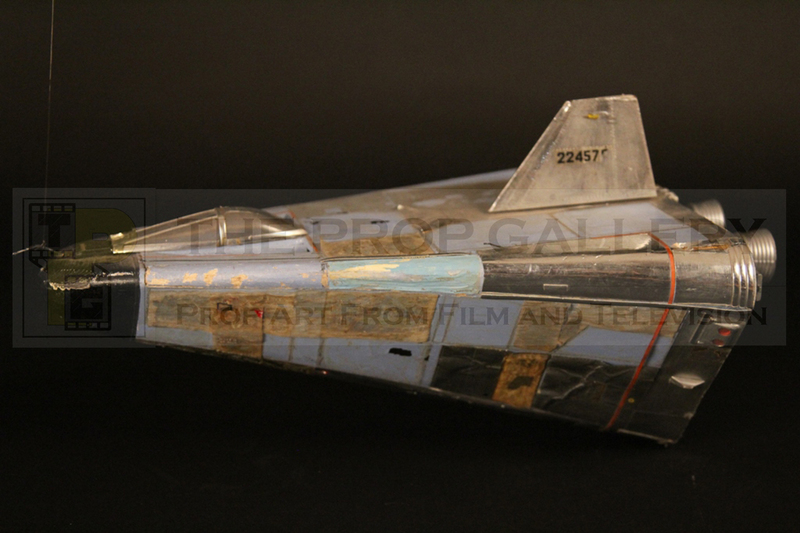 As with previous Anderson series the model effects work proved stunning with the incredible creations of Derek Meddings and prolific designer Mike Trim beautifully brought to life by the talented Century 21 model team who made a number of significant innovations in the field of miniature effects. 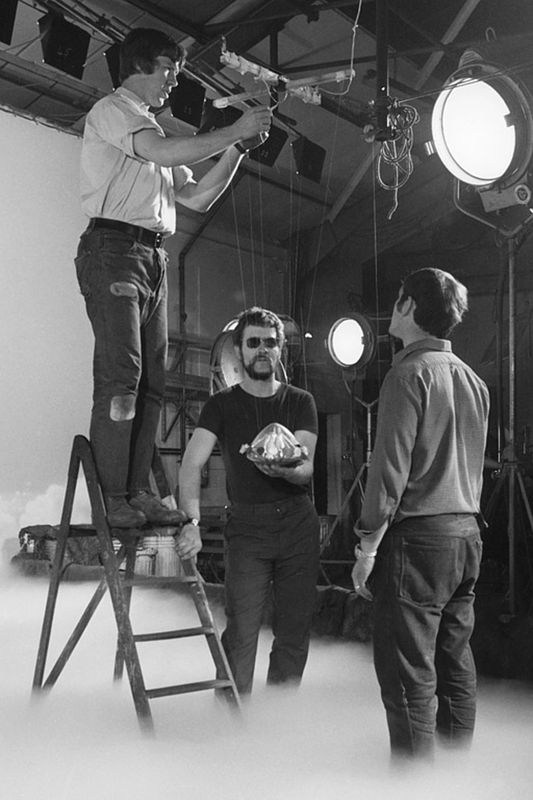 UFO was to be the final production for a team who had created some of the most iconic visons of the 1960s which even today, some 50 years later, remain a stunning sight and have proved tremendously influential in the industry. 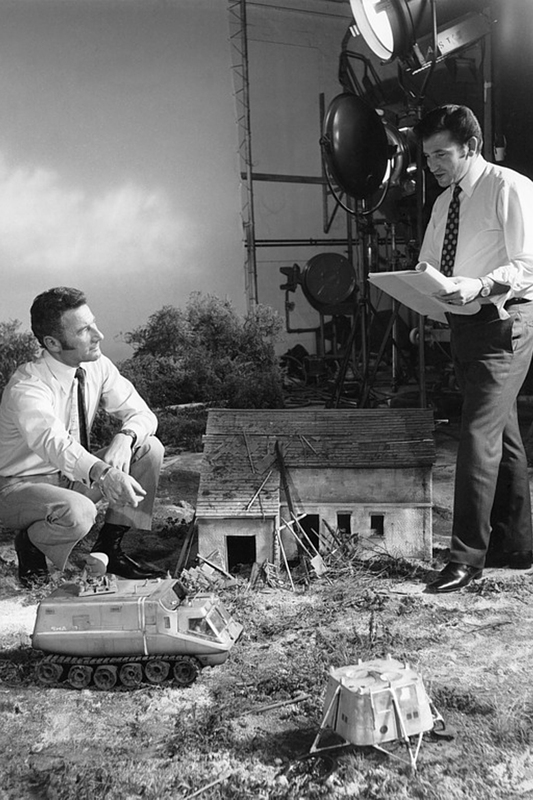 Several of the Century 21 crew became well known in the industry going on to become successful in their own right, notably Brian Johnson was already working on significant Hollywood pictures while UFO was in production going on to produce visual effects on Space: 1999 on his way to winning two Academy Awards and, of course, the late, great, Derek Meddings who later worked on Superman, James Bond and Batman winning an Academy Award and becoming one of the most highly regarded individuals ever to work in special effects whose innovations and body of work will never be forgotten. 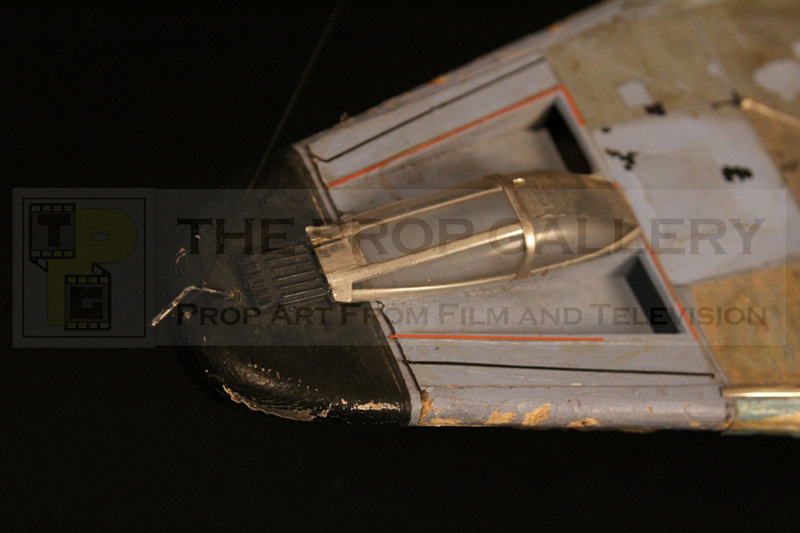 Throughout the 1960s Century 21 miniature effects contributed to some of the most influential and ground-breaking shows ever to grace our television screens, what is perhaps most impressive of all is that such effects have stood the test of time and remain highly regarded to this day. 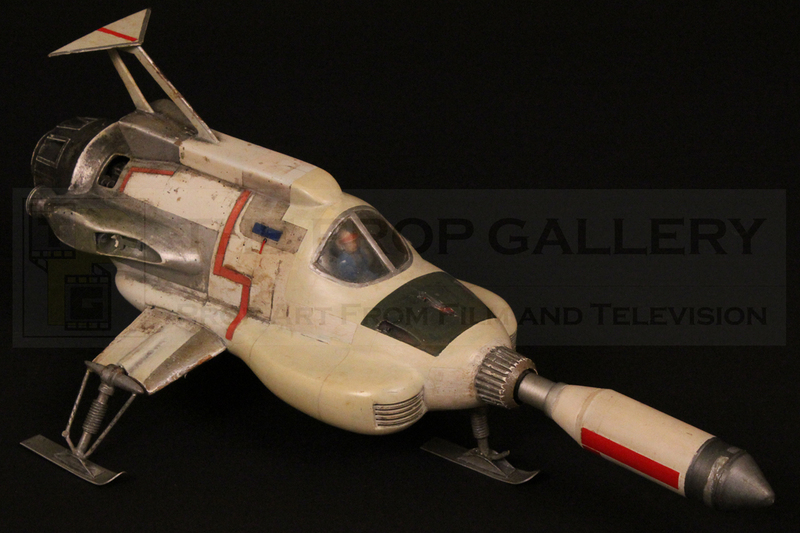 Century 21 we salute you.